W – Art for Art's Sake! Click on images to update. Wakeman, Gerald Hastings (born c.1864) poss.1864-1938. 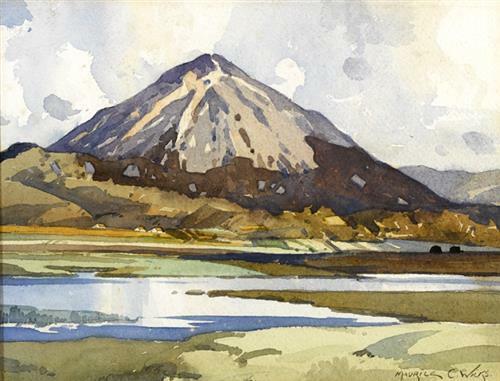 Exhibited with the Watercolour Society of Ireland in the first couple of decades of the 20th century. 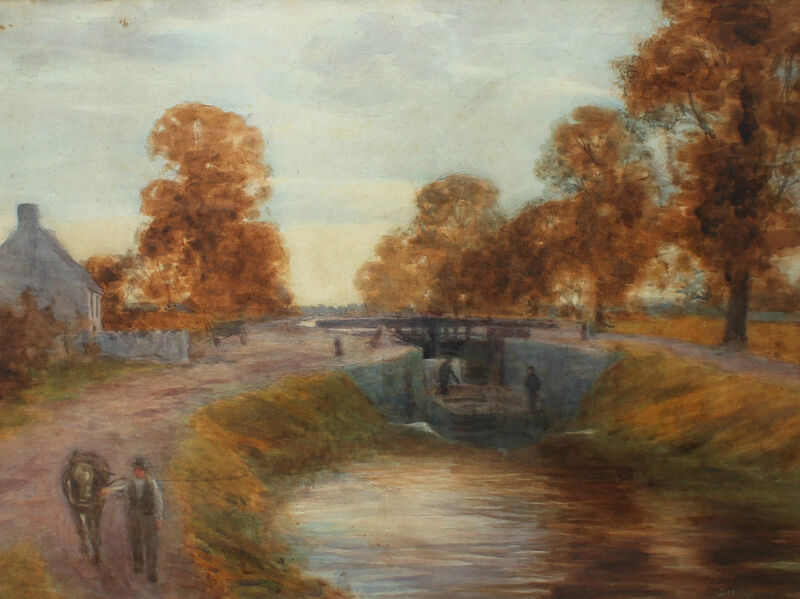 A watercolour canal scene – unknown location – offered on eBay 7/2016 for €655.00. The painting bears a label from P. Ceppi & Sons, 8,9 & 11 Wellington Quay, Dublin. The picture frame, looking glass factory and statuary manufacturers are mentioned in James Joyce’s Ulysses. 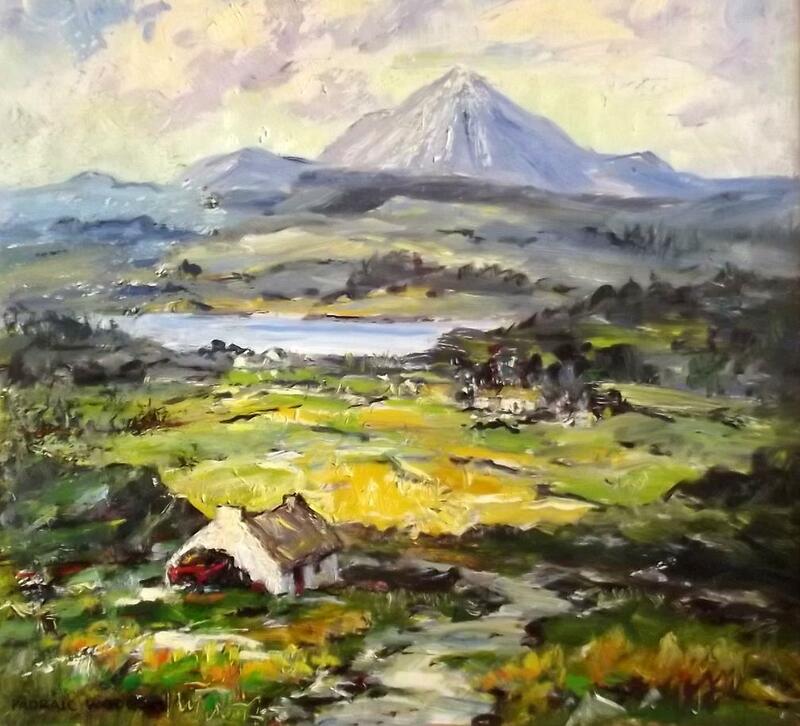 “In the Mournes” oil on canvas (14″ x 18″). Sold at Ross’s – 8/10/2014 for £320.00. “The White Arch” oil on board (14″ x 18″). Sold at Ross’s – 10/4/2013 for £120.00. Left to right:“Still Life Irises” oil on board (10″ x 8″), sold at Ross’s – 13/9/2017 for £140.00; and “Stacking the Turf” oil on board (14″ x 18″), sold at Ross’s – 6/12/2017 for £460.00. “Out for the Day” oil on canvas board (16″ x 12″). Sold at Morgan O’Driscoll’s – 2/8/2016 for €550.00. “Wetlands” oil on canvas (20″ x 16″), sold at Ross’s 26/2/15 – for £80.00. 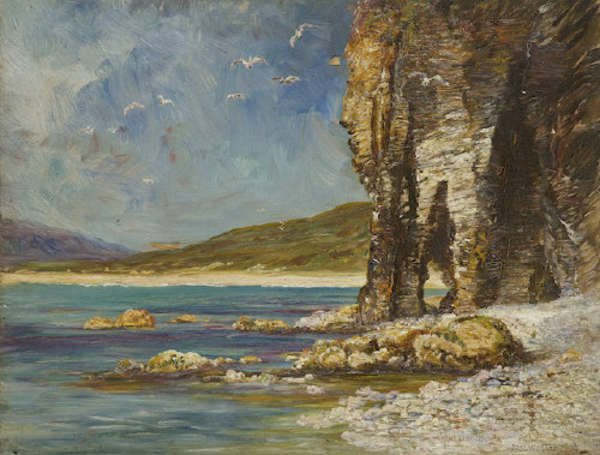 “Cathedral Rocks, Achill” oil on panel (12″ x 16″) sold at Adams – 19/2/2012 for €170.00. “A Woman’s Task” oil on canvas (14″ x 12″), sold at Adams – 5/12/2018 for €3,000. “Boats at Warrenpoint” oil on board (20″ x 24″), sold at Ross’s – 8/11/2017 for £60.00. 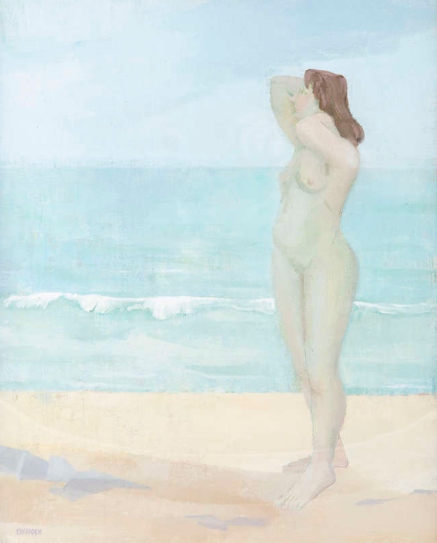 Born in Dublin, he exhibited at the Royal Hibernian Academy from 1914. 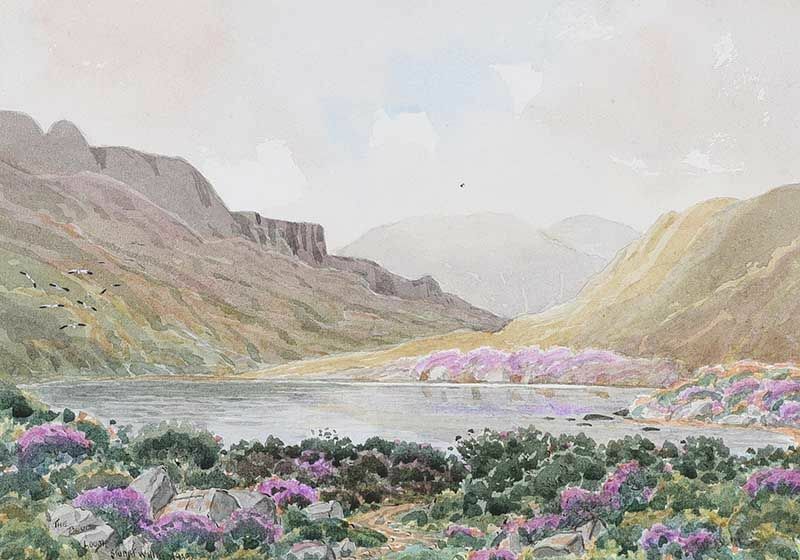 He was the author of ‘Irish Life and Landscape’, (Talbot Press, Dublin, 1926) and his work is represented in many of the major public collections in Ireland. 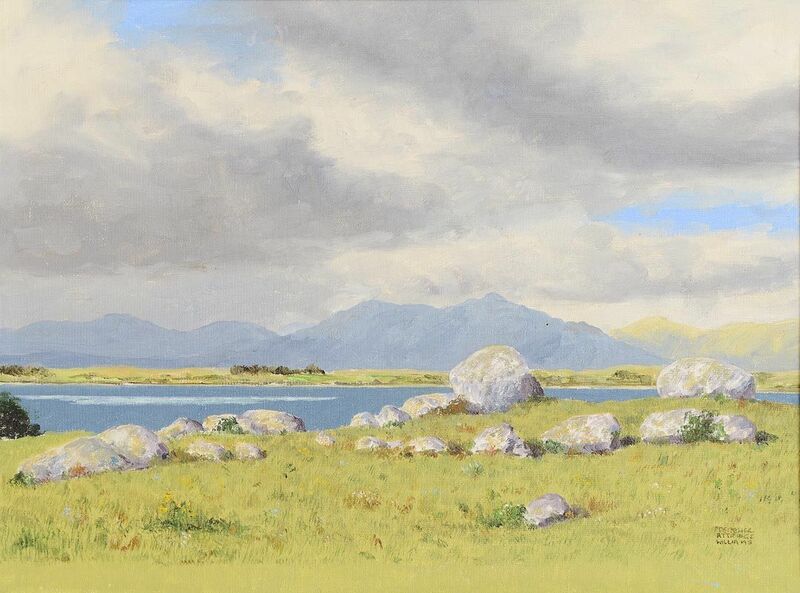 Left to right: “Looking towards Glenbeigh, Co.Kerry” oil painting from the artist’s Irish Life and Landscape book; and “A Relic of the Past – Feltrim” oil on canvas (13.5″ x 19″), sold at Whyte’s – 26/6/2000 for €1,079. 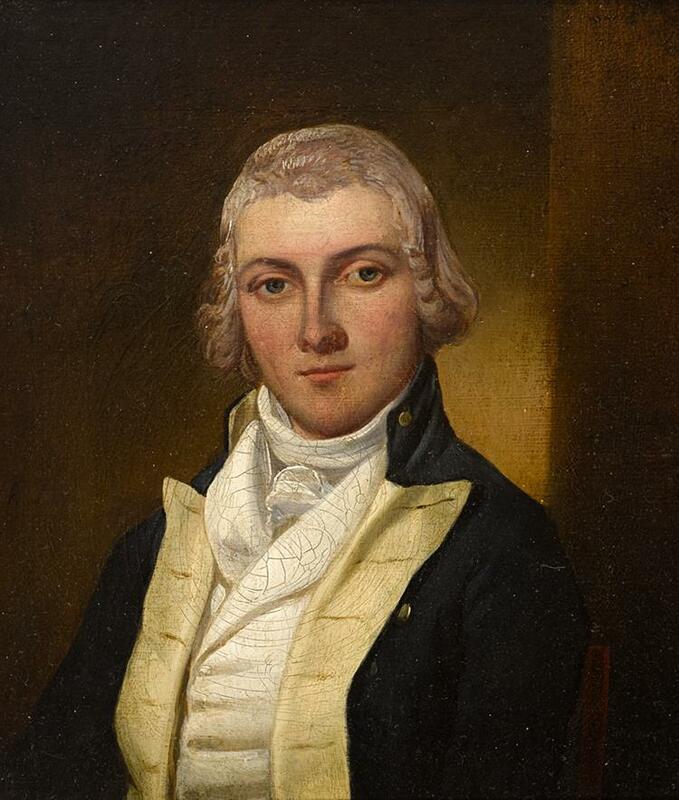 English born portrait artist – father of David Bond Walker. 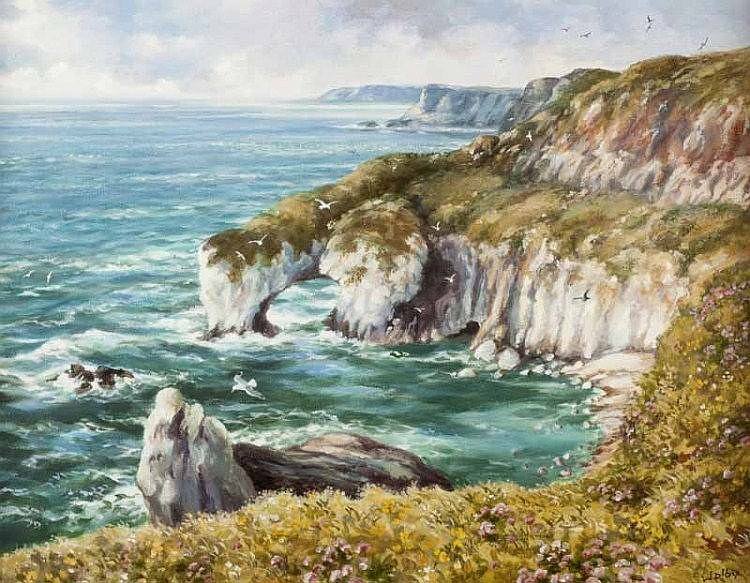 “West of Ireland, Coastal Seascape” oil on canvas (12″ x 16″), sold at O’Reilly’s, Dublin – 26/9/2018 for €320.00. 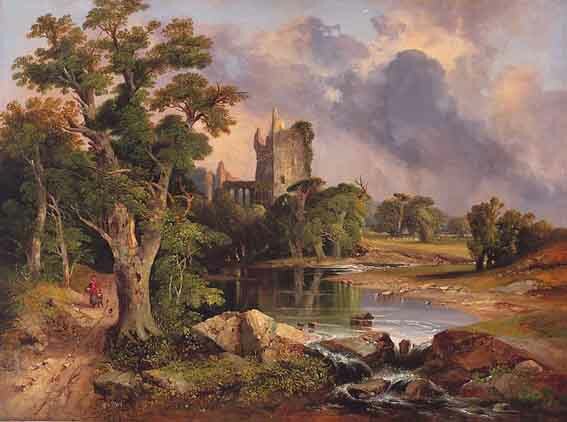 “Blarney Castle, Near Cork, Ireland” 1860, oil on canvas (22″ x 30″). Sold at Whyte’s – 13/3/2001 for €5,840.00. 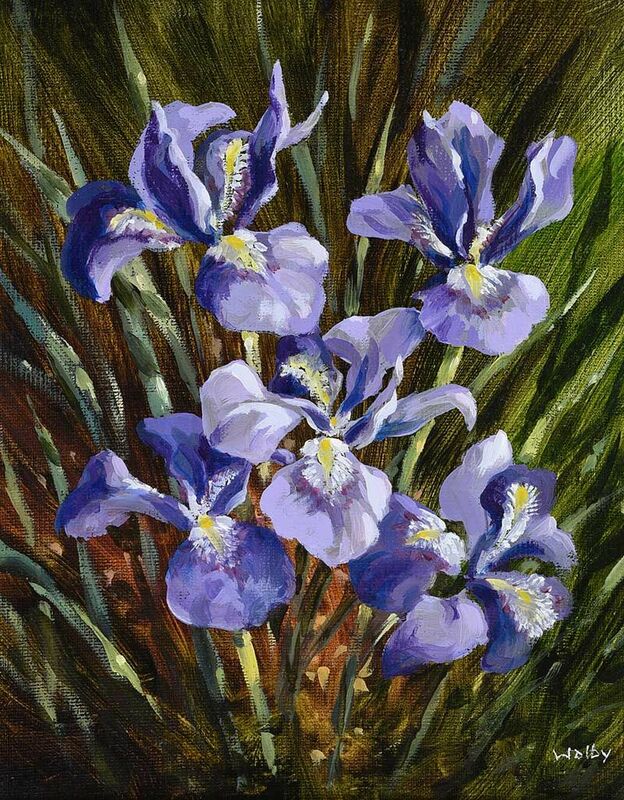 “In the Flower Bed” ( 10″ x 12″) oil on canvas. Sold at Ross’s 22/6/2016 – £90.00. “Dunluce Castle” (16″ x 20″) oil on canvas board. Sold at Morgan O’Driscoll’s 26/5/2008. 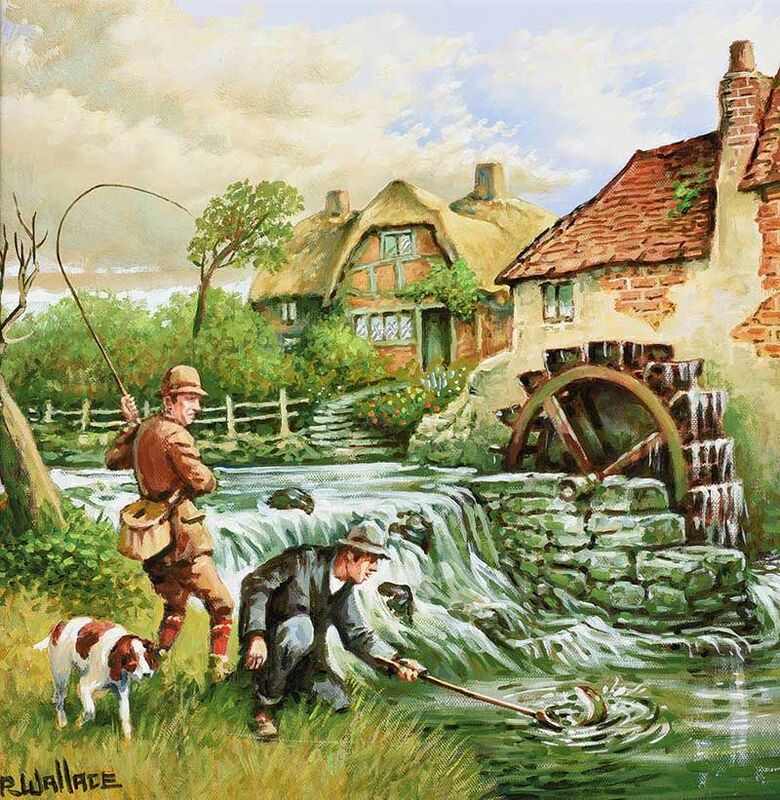 “Fishing by the Old Mill Stream” oil on board (16″ x 16″), unsold at Ross’s – 11/10/2017. 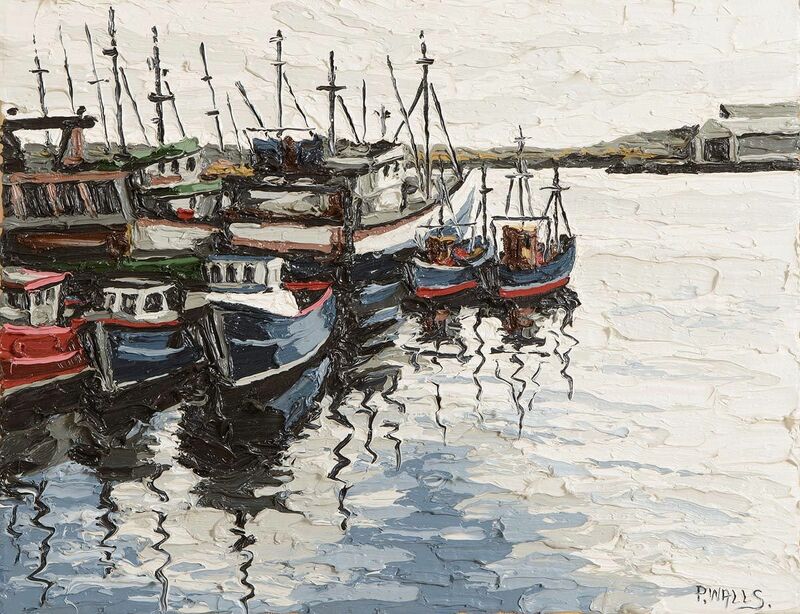 “Harbour Killybegs Reprise I” oil on canvas, sold at Morgan O’Driscoll – 28/4/2014 for €650.00. Edward Walsh, a merchant’s son, was born in Waterford. He studied medicine at Glasgow and Edinburgh before entering the military, where he had his hand shattered by an explosion while serving under Nelson during the British attack on Copenhagen in 1801. He was afterwards sent with the 49th regiment to Canada, where he spent some years studying Native American life (circa 1803-1806). He collected a vast amount of information for a statistical history of Canada, but never published the work. 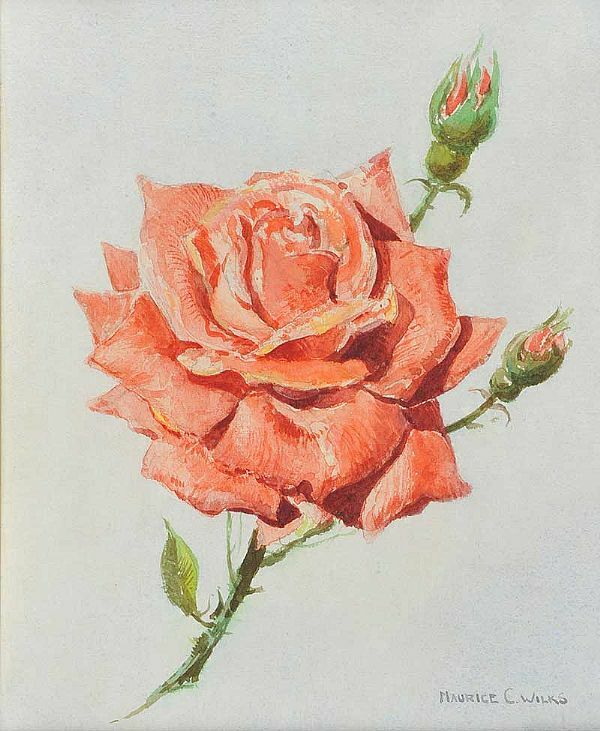 The William L. Clements Library, Michigan, holds seventeen watercolours from his time in Upper Canada. Following his time in North America, he returned to Europe, serving in the Peninsular War as well as at the Battle of Waterloo in 1815. Eventually returning to Ireland, he died in Dublin in 1832. 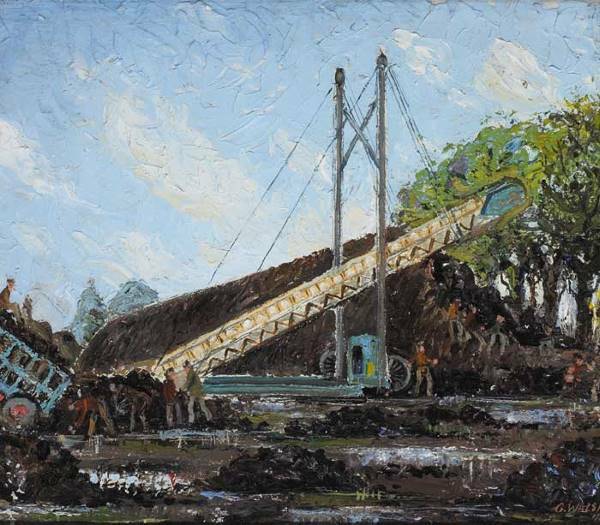 “Clamping Turf, Phoenix Park” dated 1944, oil on canvas (17″ x 19.5″), sold at Whyte’s – 25/4/2006 for €1,100. 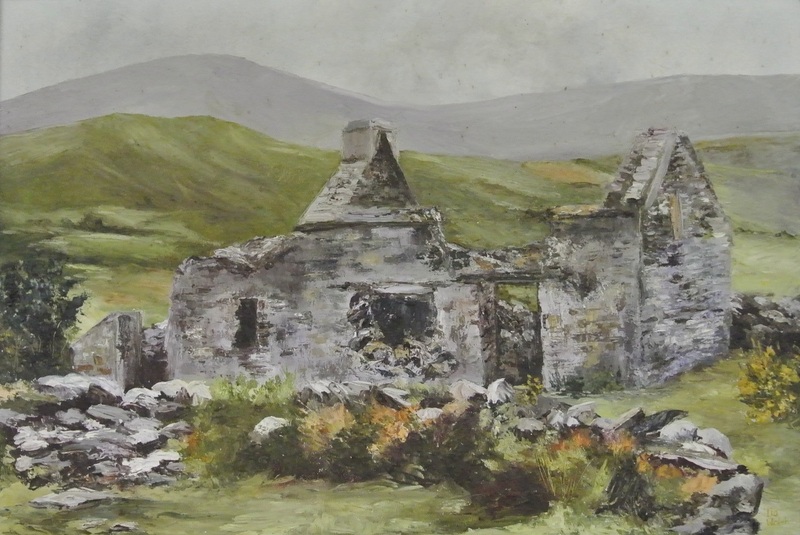 “Ruin of a Stone Cottage” oil on canvas (19.5″ x 29.5″), sold at Woodward’s, Cork – 26/5/2018 for €70.00. 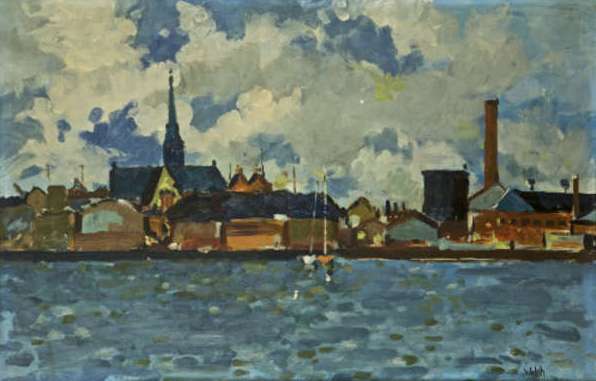 “Ringsend Basin” oil on board (21″ x 32″), sold at Adam’s – 28/9/2011 for €950.00. 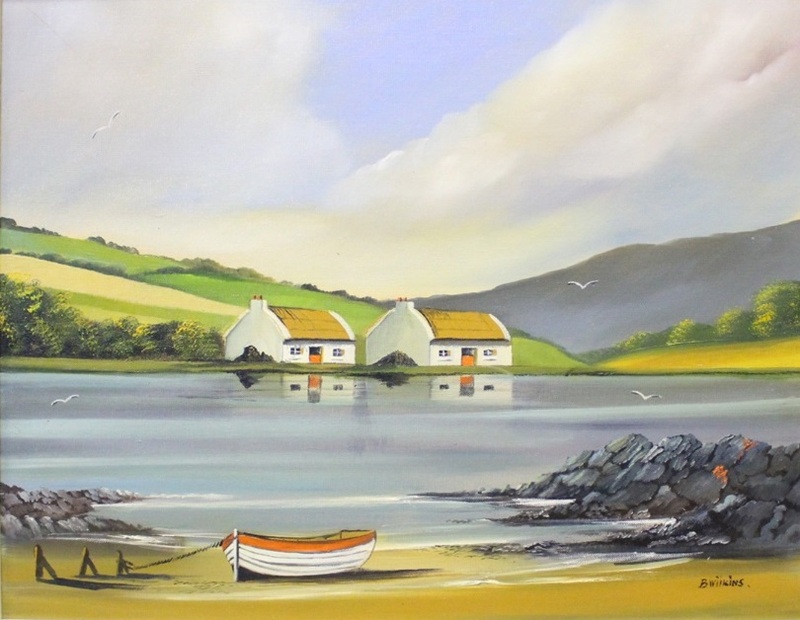 Dublin born artist now living and working in County Wexford. 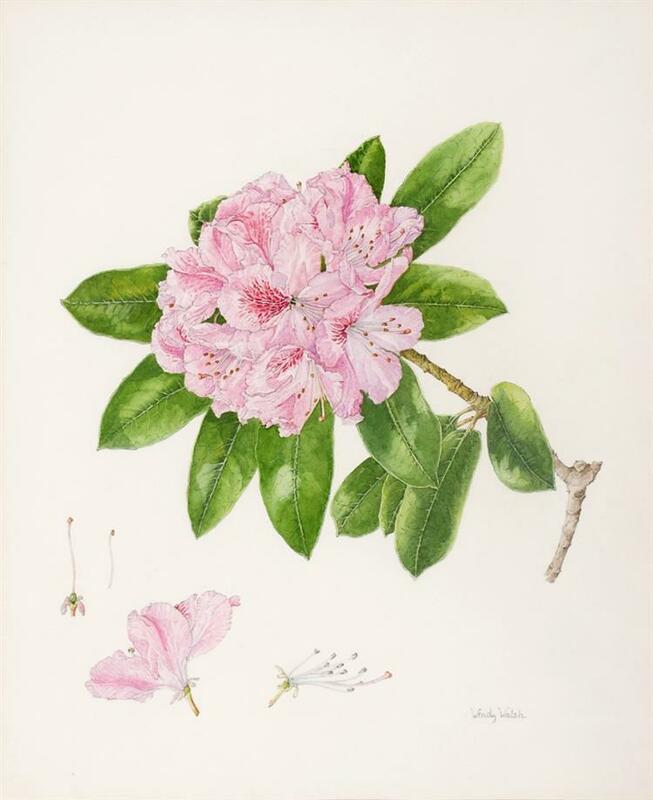 “Rhododendron II” dated 1987, watercolour (17″ x 14″), sold at Whyte’s – 17/7/2017 for €900.00. 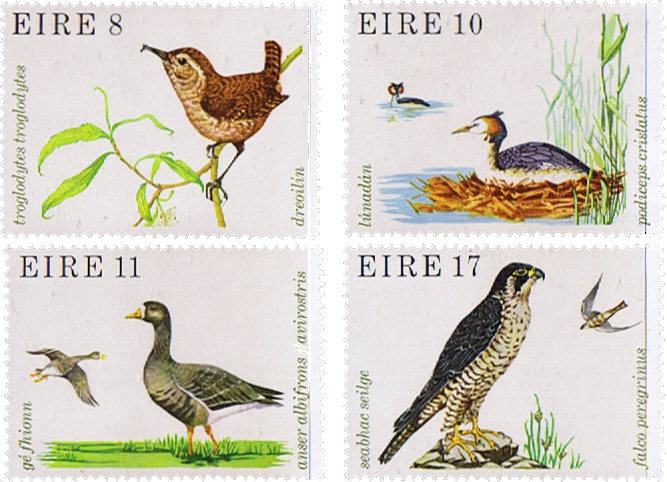 1979 Wildlife stamps for An Post. 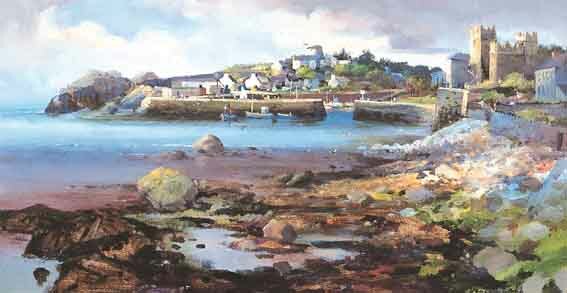 Dublin born Michael Wann now lives and works in Co. Sligo having gained his BA in Fine Art from Sligo Institute of Technology. 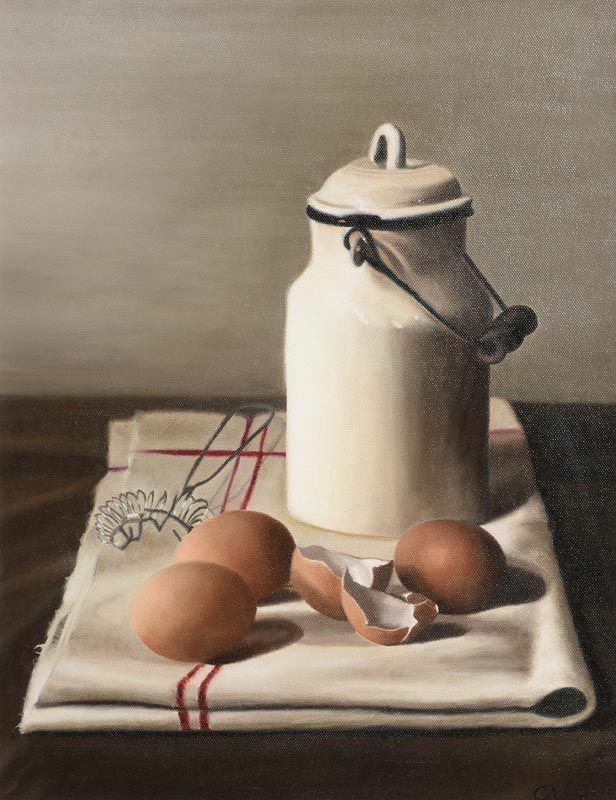 “Billy Can & Eggs” oil on canvas board (18″ x 14″), sold at Morgan O’Driscoll’s – 24/10/2016 for €700.00. 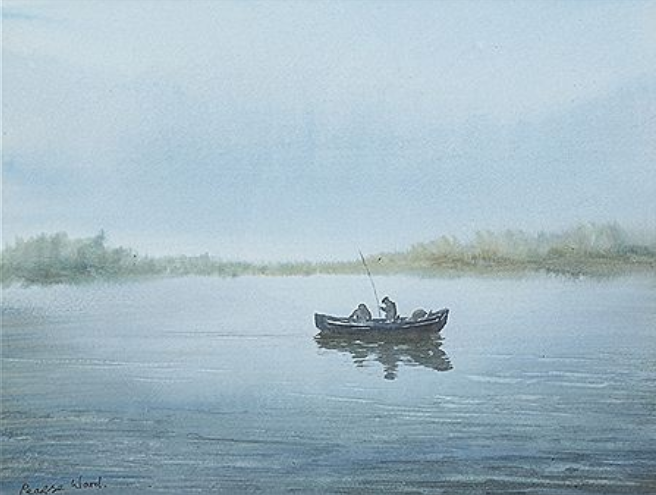 “Morning on the Lake” (1996) watercolour, sold at Whyte’s Christmas Art Sale 9/12/2012 – €200.00. Born in Dublin, she studied at the National College of Art & Design, Regent Street Polytechnic in London, and André L’Hote in Paris. She later lectured at NCAD from 1973 to 1984. “The Sky Road, Clifden” mixed media on card (7″ x 11″), sold at Morgan O’Driscoll’s – 23/1/2017 for €300.00. “Shore Light and Mode” oil on canvas (19″ x 15″), unsold at Adam’s – 27/3/2019. 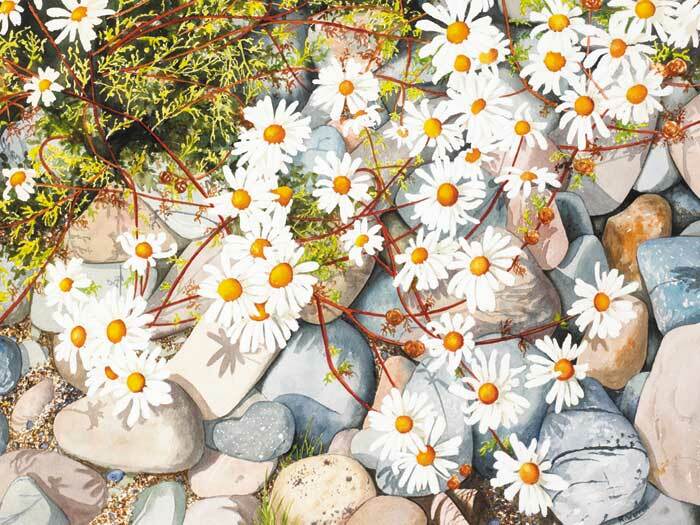 “Seashore Garden” watercolour (12″ x 16″), sold at Whyte’s – 26/5/2007 for €400.00. “Killarney Lakes” oil on panel (6″ x 10″), sold at Whyte’s Online Sale – 24/10/2016 for €1,000.00. 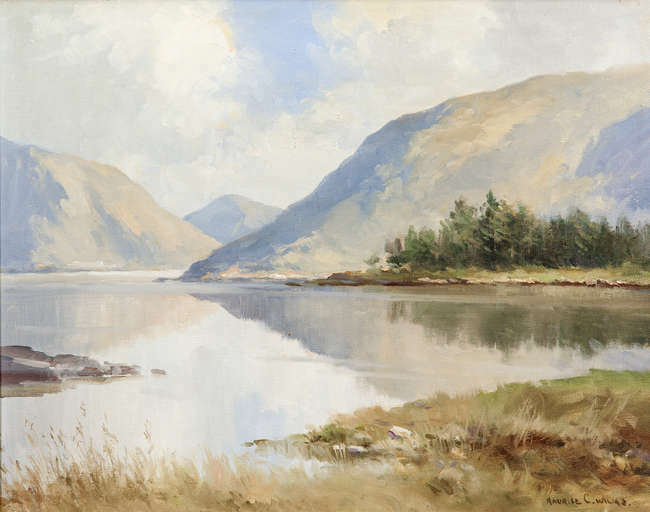 “Cloon Lake, Glencar, Co.Kerry” oil on canvas (13″ x 20″), unsold at Sotheby’s (London) – 21/11/2018. 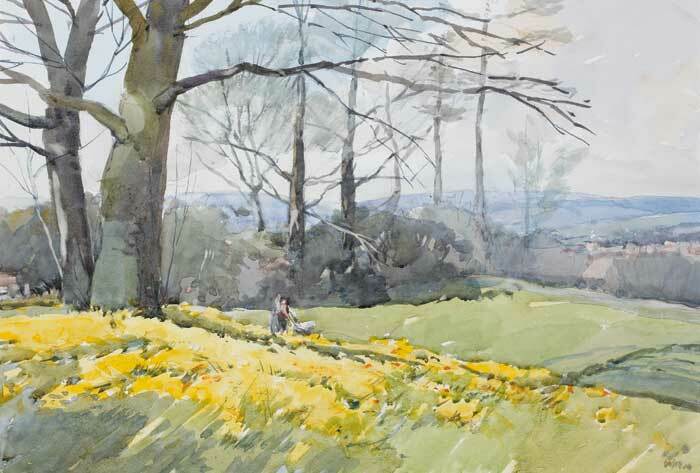 “Daffodils at Lady Dixon Park, Belfast” watercolour (14″ x 20″), sold at Whyte’s – 6/12/2008 for €100.00. 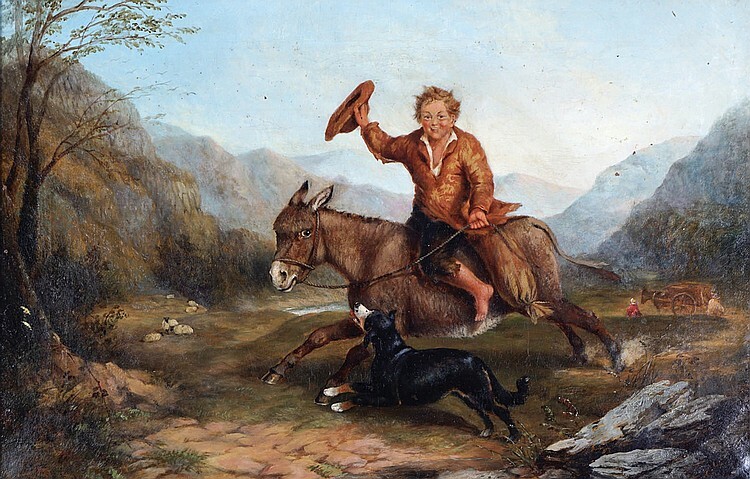 A Young boy on a donkey in a landscape setting, dated 1849, oil on canvas (20″ x 30″), sold at Sheppard’s – 25/9/2018 for €700.00. 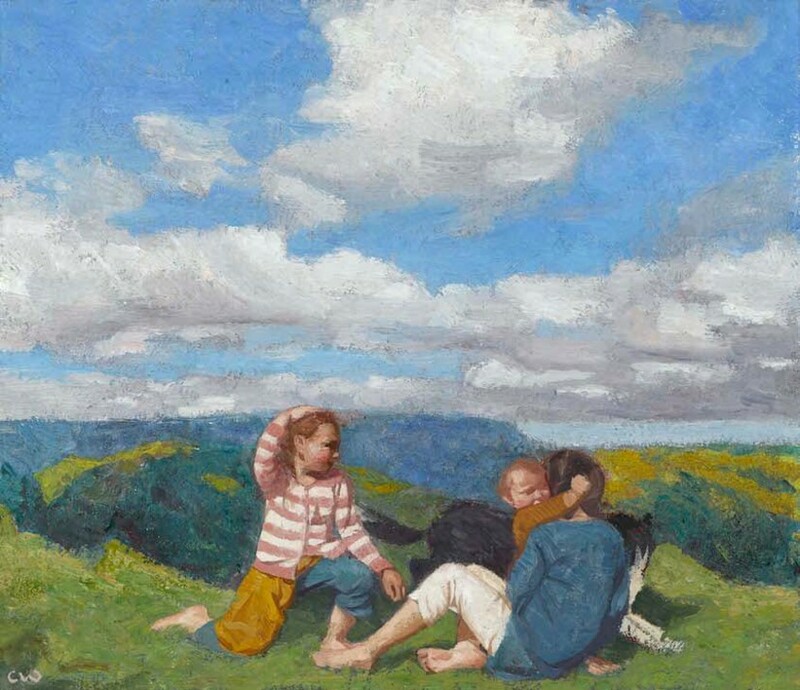 Samuel Rowan Watson was born and worked in Dublin, and was a regular exhibitor at the Royal Hibernian Academy of Arts between the years 1910 and 1923, where he showed just under 20 paintings, mainly local landscapes and scenes of everyday life in Dublin. “Wuy Yeh! 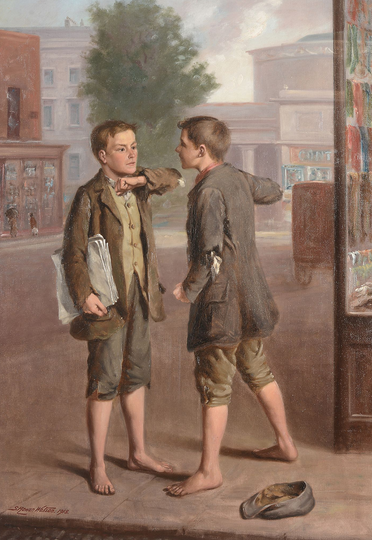 (Paper Boys), Dublin” oil on canvas (38″ x 27″) signed and dated 1918. The Dublin street scene depicted in the work above work is actually a view from the doorway of Watson’s studio, which was located at 34 Sackville Street (now O’Connell Street), and shows Miss J. Morris’s millinery shop and the Rotunda Hospital in the background. Dreweatts & Bloomsbury. Assumed to be an Irish artist. 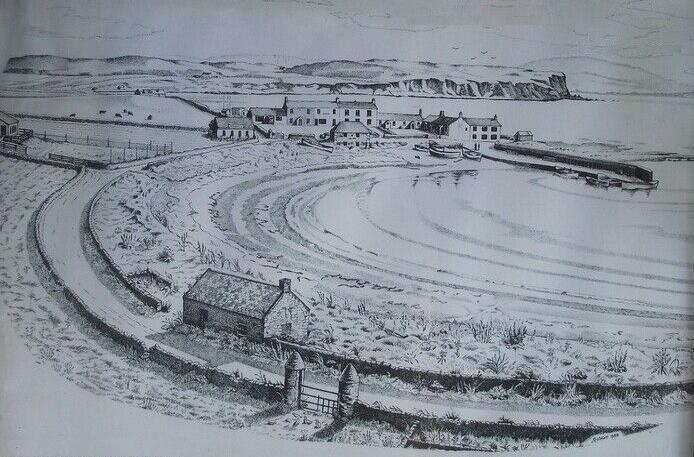 Left to right: “St.Thomas’ Church, Rathlin Island” 1981 and “The South Pier, Church Bay, Rathlin Island” 1988. “The River Lagan” watercolour drawing (10″ x 13″), sold at Ross’s – 9/11/2016 for £50.00. 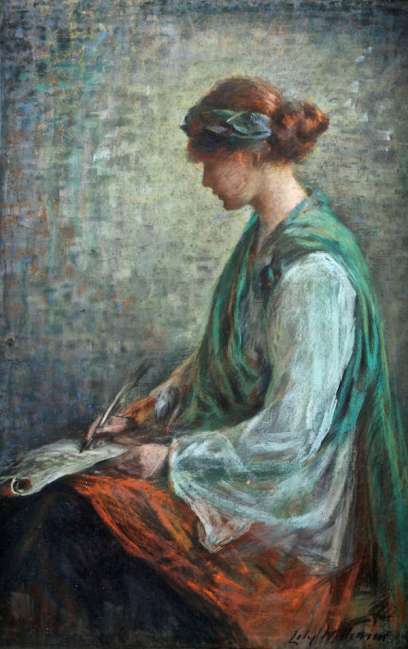 Josephine Webb was part of a lively circle of artists and writers that surrounded Yeats. She grew up in Dublin as part of a large Quaker family and attended Alexandra College and the Queen’s Institute. In 1878 she continued her Art studies in Paris at the and Holland. 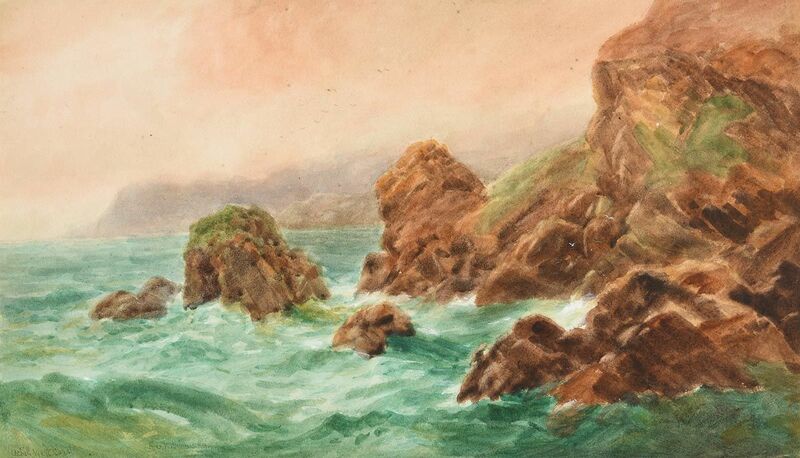 She exhibited her work at the RHA and the Watercolour Society of Ireland in the early 1890/1900s. 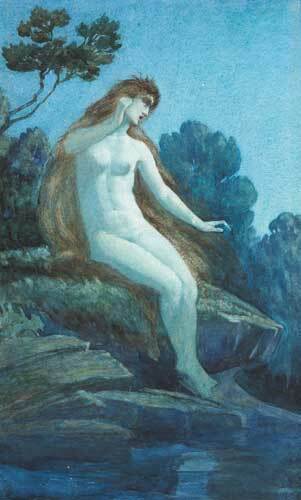 Her paintings can be found in the collections of the National Gallery of Ireland and the Hugh Lane Gallery. 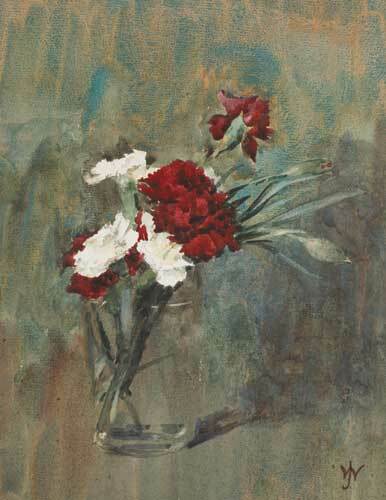 “Red and White Carnations in a White Vase” watercolour and pastel over pencil (10.5″ x 8″), sold at Whyte’s – 27/5/2006 for €1,100. “Lake Landscape” oil on canvas (15″ x 36″). 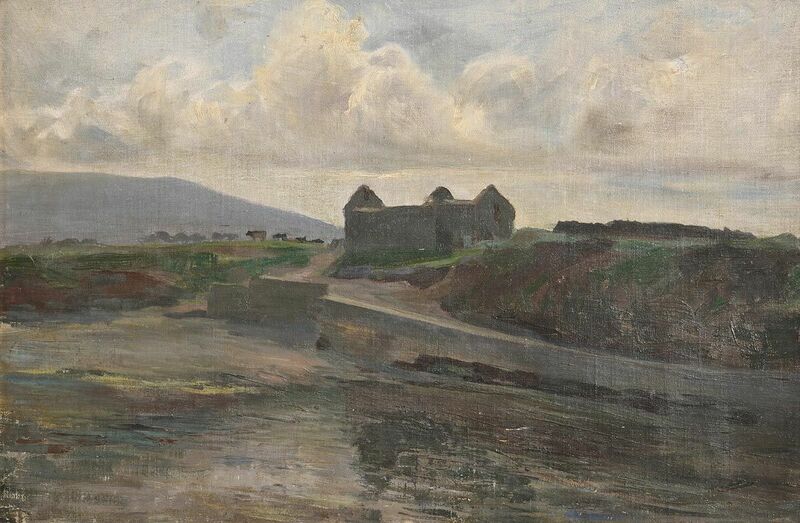 “Bulloch Harbour and Castle” oil on canvas (16″ x 30″), sold at Whyte’s 13/6/2001 for €6,094 including buyer’s premium. 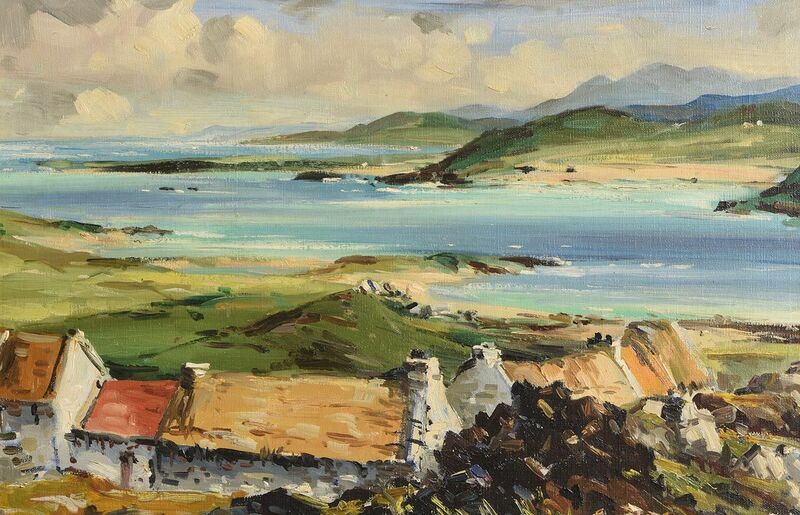 “Irish Cottages, Connemara” dated 1961, oil on canvas (15″ x 23″), sold at Morgan O’Driscoll’s – 24/10/2016 for €1,100.00. “Ballycopeland Mill, Millisle, Co.Down” oil on canvas (14″ x 36″), sold at Morgan O’Driscoll’s – 25/9/2018 for €1,800. 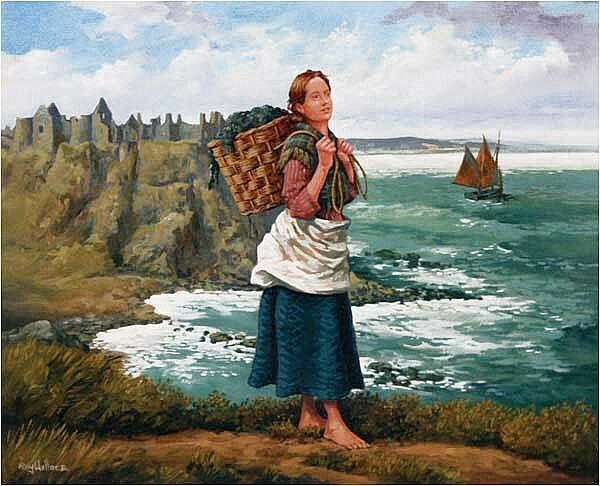 An Irish artist from the Victorian era. 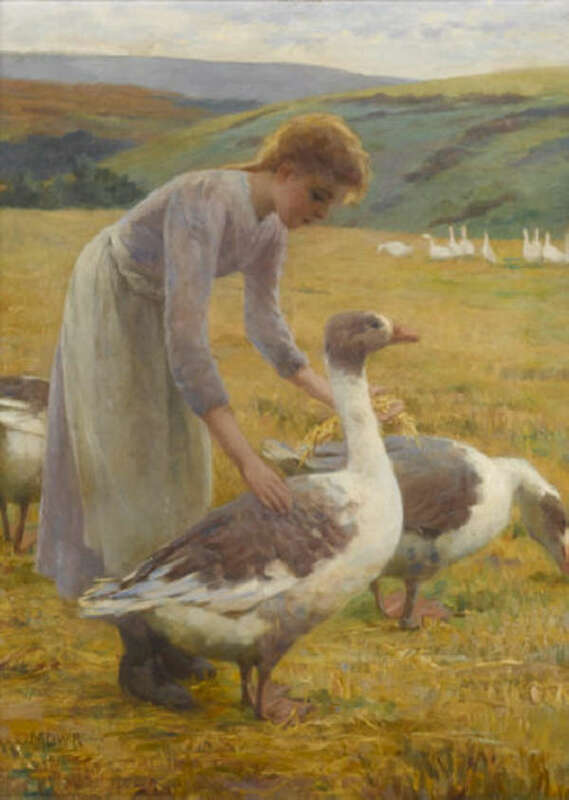 “Goose Girl” oil on canvas (29″ x 21.5″) sold at James Adams sale 5/12/2006 – €16,000. 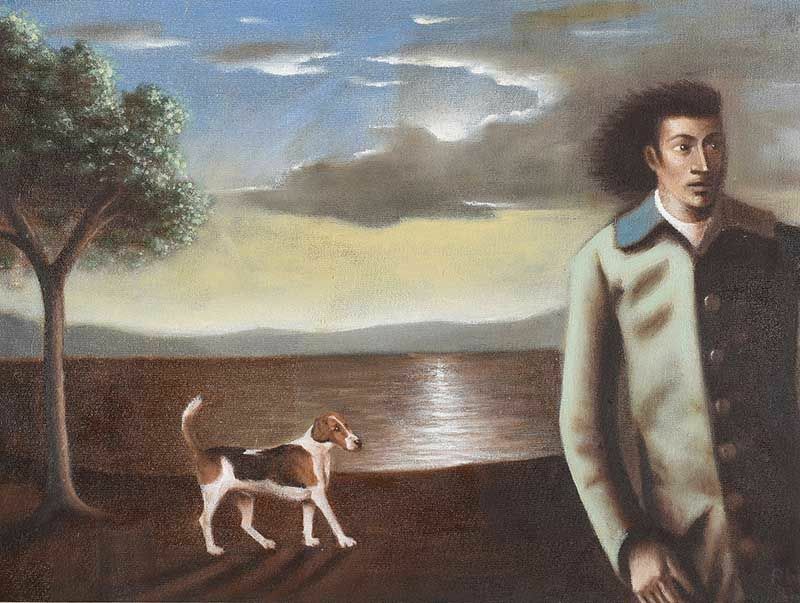 “Cross Country” oil on canvas, dated 1995 (29.5″ x 39.25″). 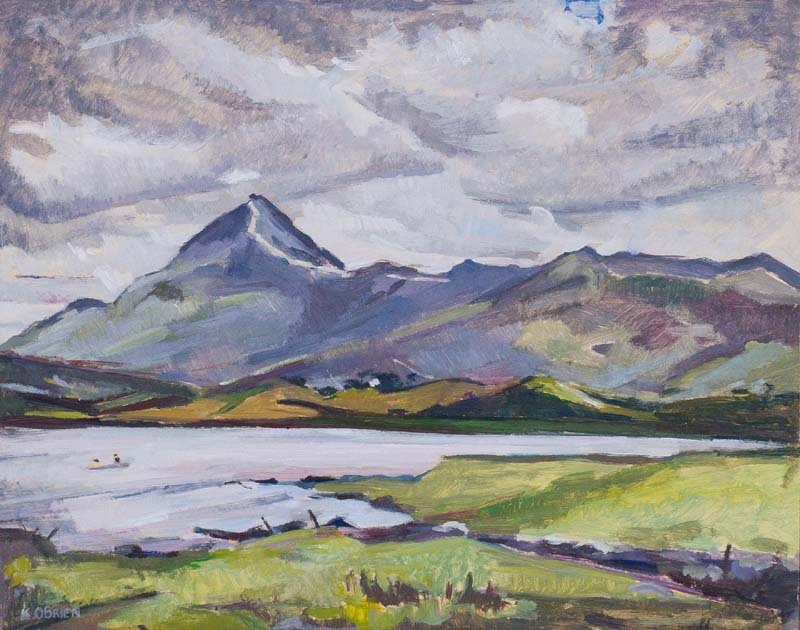 “Bringing Home the Turf, Connemara” dated 1979, oil on canvas (12″ x 28″), sold at Morgan O’Driscoll’s – 3/10/2016 for €420.00. Leila Webster was an honorary member of the Ulster Society of Woman Artists, but was more well-known as a Belfast actress and comedienne. “Cockle Row, Groomsport” oil on board (16″ x 20″). 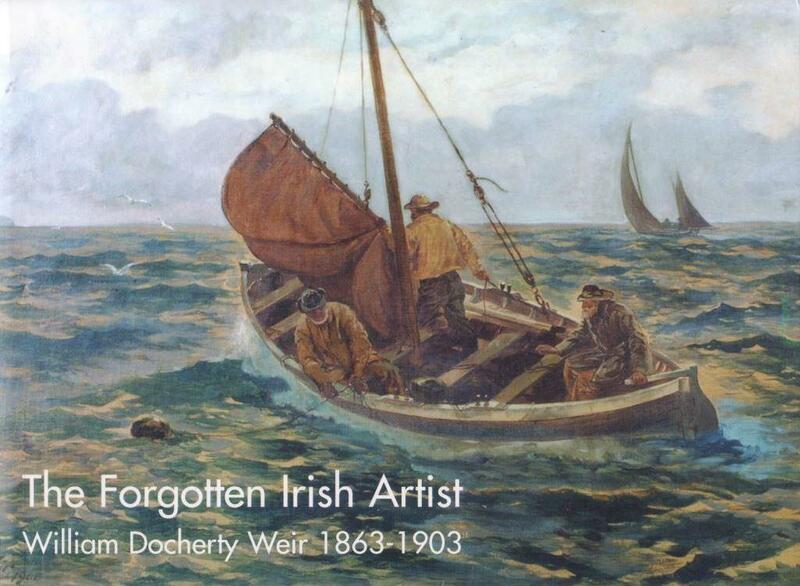 William Docherty Weir worked in Belfast for the well-known firm, David Allen and Sons of London as their chief graphic designer and was a founder member of The Belfast Ramblers’ Sketching Club in 1879, the parent body of the Royal Ulster Academy. “Gathering Seaweed, Carlingford Lough” (28″ x 36″) oil on canvas, sold at Ross’s – 8/8/2013 for £280.00. 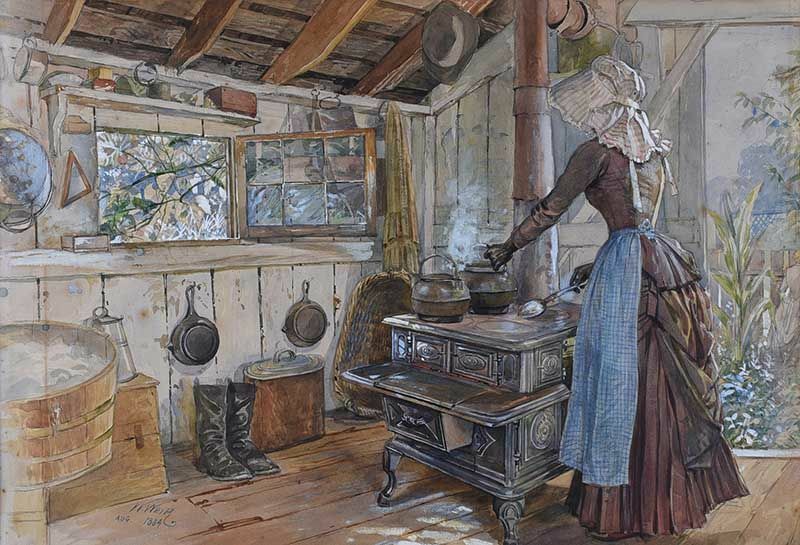 “Simmering the Pot” watercolour drawing (13″ x 19″), unsold at Ross’s – 10/4/2019. Published (2003) by The Cleft Gallery, Donaghadee, Co.Down. Hardback, 30 pages (27 full colour illustrations) + bio. Born in Fleet Street, Dublin. 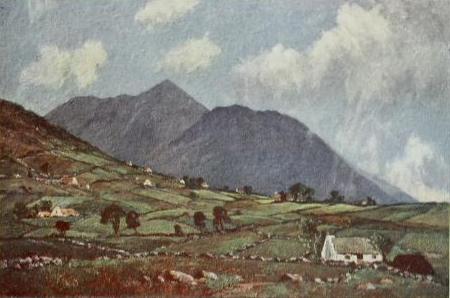 “Killarney” (c.1807) watercolour – part of the Paul Mellon Collection at the Yale Center for British Art in New Haven, Connecticut, USA. A Northern Ireland based artist who specialises in vintage transport subjects. “The Narrow Gauge at Ballymena“. 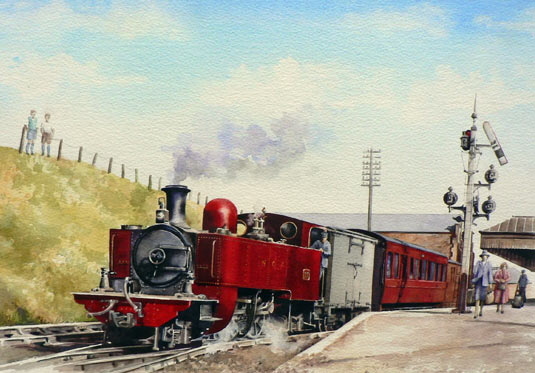 Debra specialises in painting historic themes and events, mainly motorsport, vintage and classic car portraits, steam trains and railways – anything transport related, preferably vintage or just old! 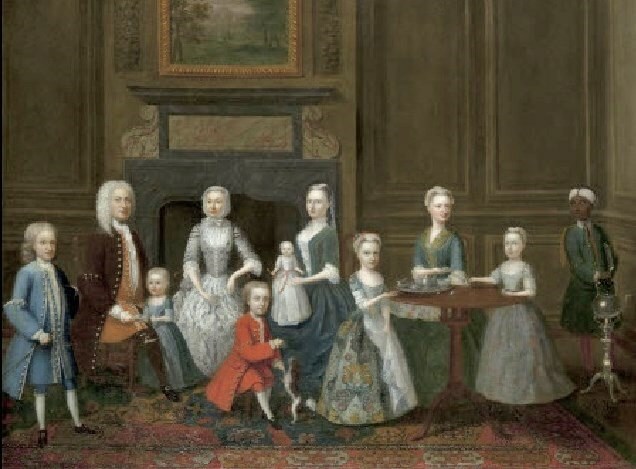 “Thomas Smith and his Family” 1735. 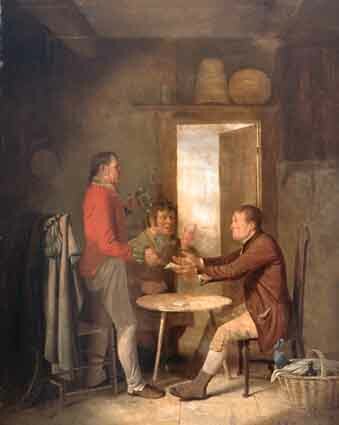 Left to right: “A Dispute over Cards” oil on panel (21″ x 16″), sold at Whyte’s – 9/10/2001 for €11,427 including buyer’s premium; and Portrait of a Gentleman, oil on panel (8.5″ x 7.5″), sold at Whyte’s – 27/11/2017 for €850.00. “Waiting” oil on canvas (54″ x 38″), sold at de Vere’s – 22/11/2016 for €60,000. “The Blue Lough” watercolour drawing (7″ x 10″), unsold at Ross’s – 6/12/2017. 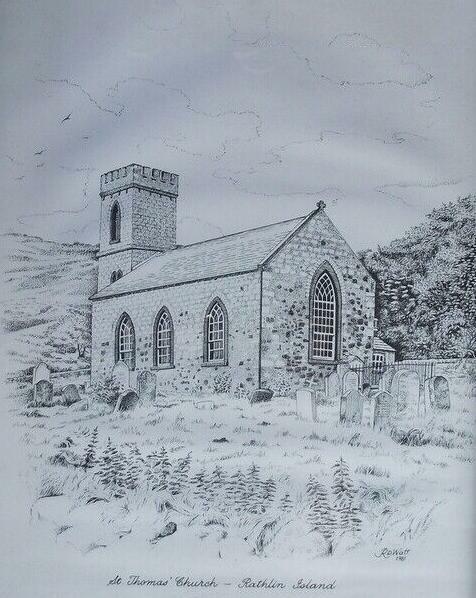 Norman Whitla was born in Bangor Co. Down in 1936. He is a trained tool maker and machine tool designer who has worked in both Belfast and Toronto, Canada. From early days Norman has been interested in sketching “things mechanical” and soon developed an appreciation for ‘art in industry’. 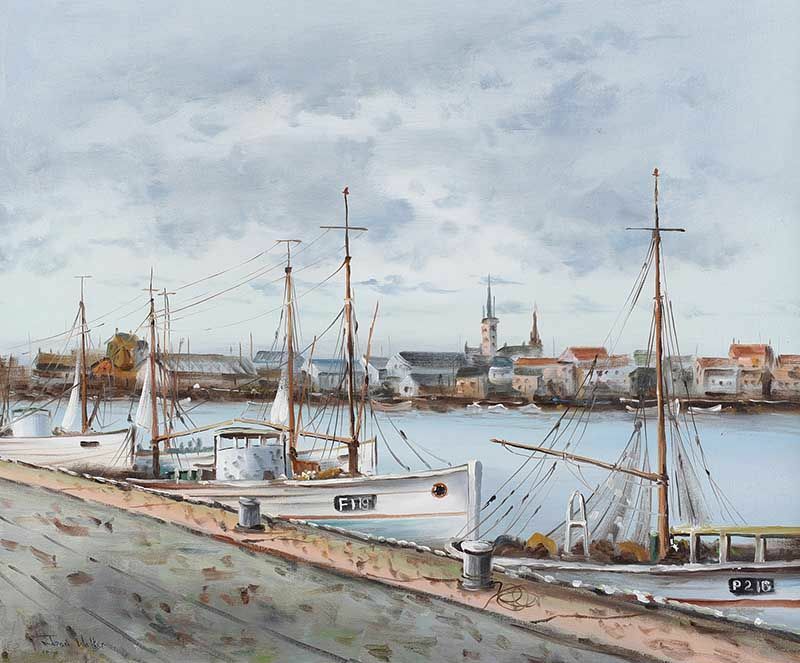 Later in life he took to painting, specialising in subjects such as industry of the past e.g, steam railways, agricultural machinery, vintage and classic road vehicles, sail and steam shipping, tramways, aircraft etc. 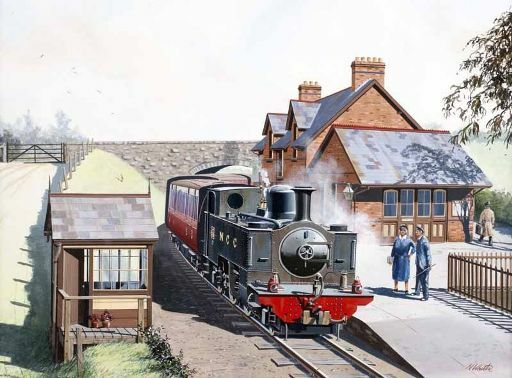 “Kells Railway Station” on the Ballymena & Larne Narrow Gauge. Sold at auction a couple of years ago for a snip at just £180.00! Norman & Di Whitla’s website Heritage House Arts is well worth checking out! 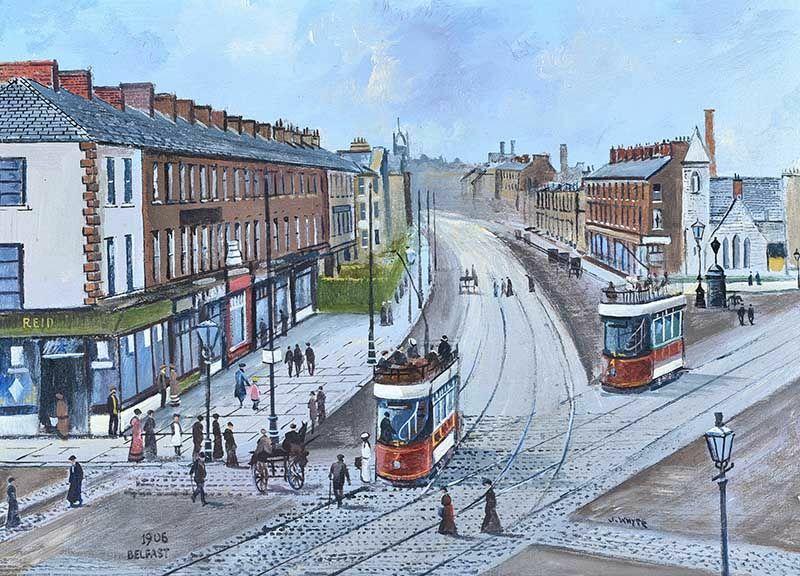 “Belfast, 1906” oil on canvas (15″ x 21″), sold at Ross’s – 7/11/2018 for £60.00. A self-taught artist from Belfast known for his colour palette and emotionally charged portraits in graphite and paint. “Thatched Cottages in an Irish Landscape” oil and canvas (16″ x 20″), sold at Hegarty’s, Bandon – 27/1/2019 for €150.00. 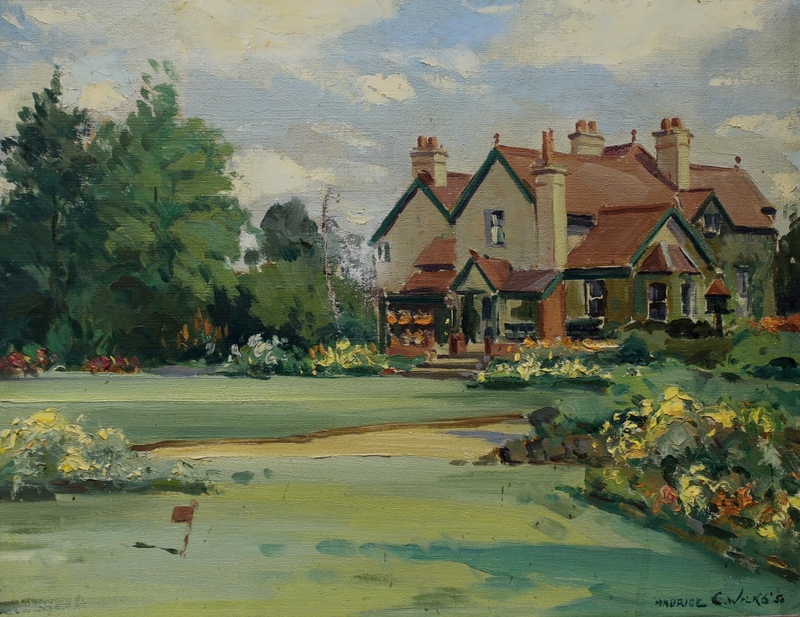 English born artist who lived in Glenageary, County Dublin in the first decade of the 20th century. An art teacher she is recorded as having exhibited 22 times at the RHA between 1893 and 1914. 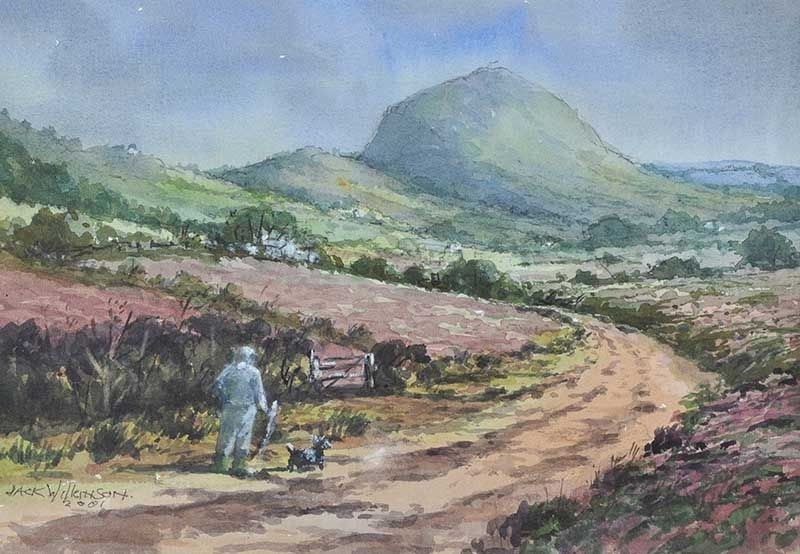 “Slemish” watercolour drawing (10″ x 14″), unsold at Ross’s 7/12/2016. 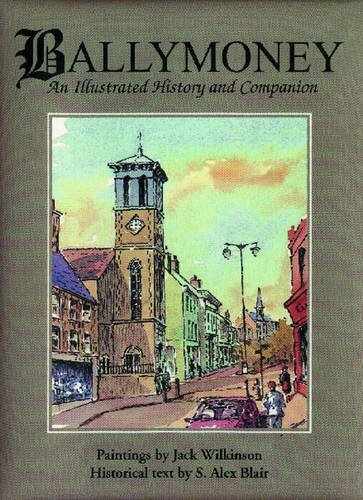 Above: more of the artist’s work can be found in “Ballymoney: An Illustrated History and Companion” – Cottage Publications (1995). Plenty of copies available online for very little. 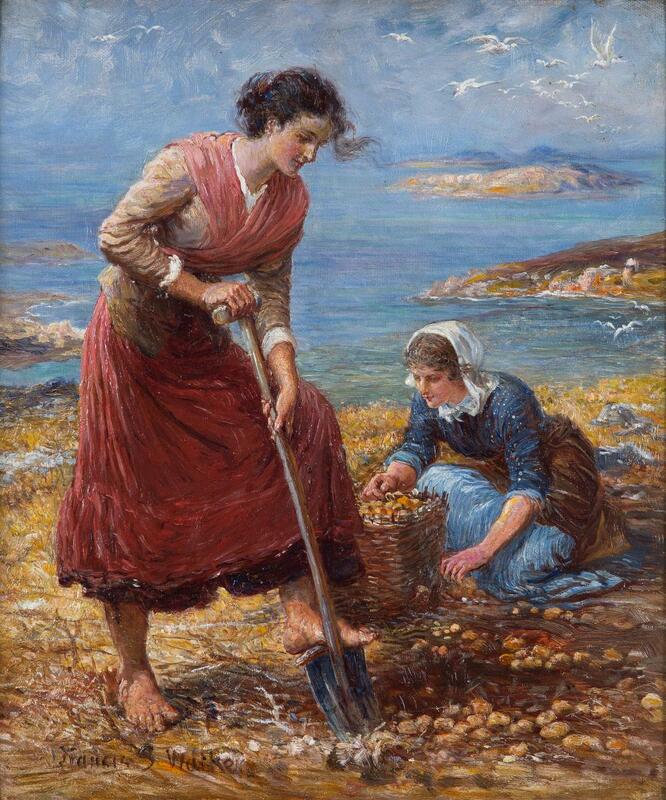 Maurice Canning Wilks was an Irish landscape painter. Born in Belfast in 1910 to a linen designer, he was educated in Belfast at the Malone Public School and attended evening classes at the Belfast College of Art. 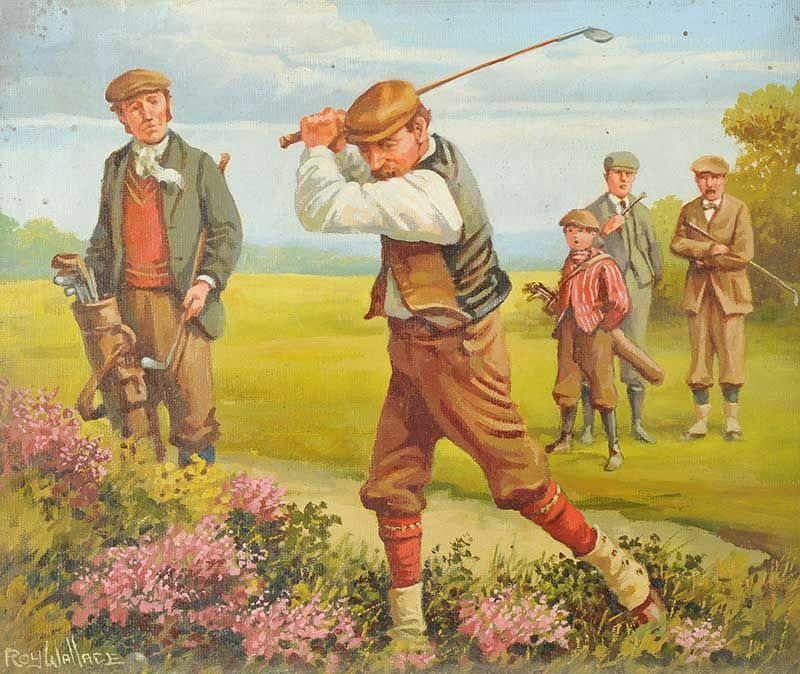 Wilks was only nineteen when he won the Dunville scholarship. He later exhibited at the Royal Hibernian Academy, Dublin and also at the Oireachtas. 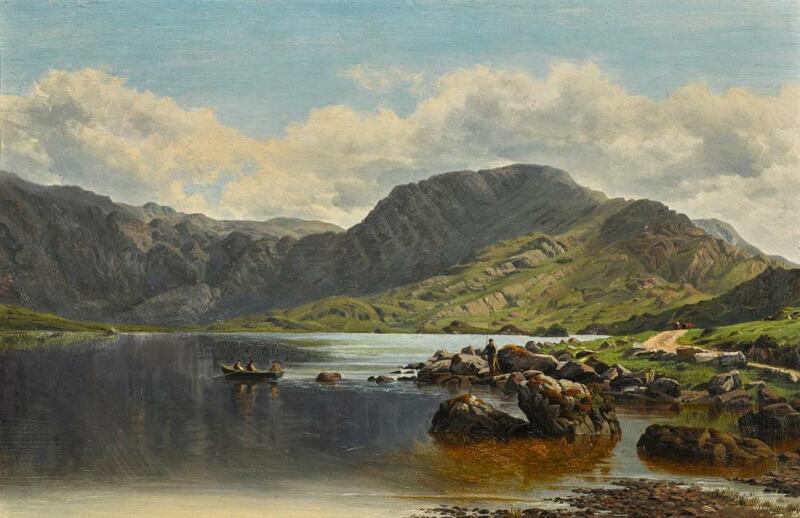 In his early years as an artist he resided in Cushendun, in the Glens of Antrim. 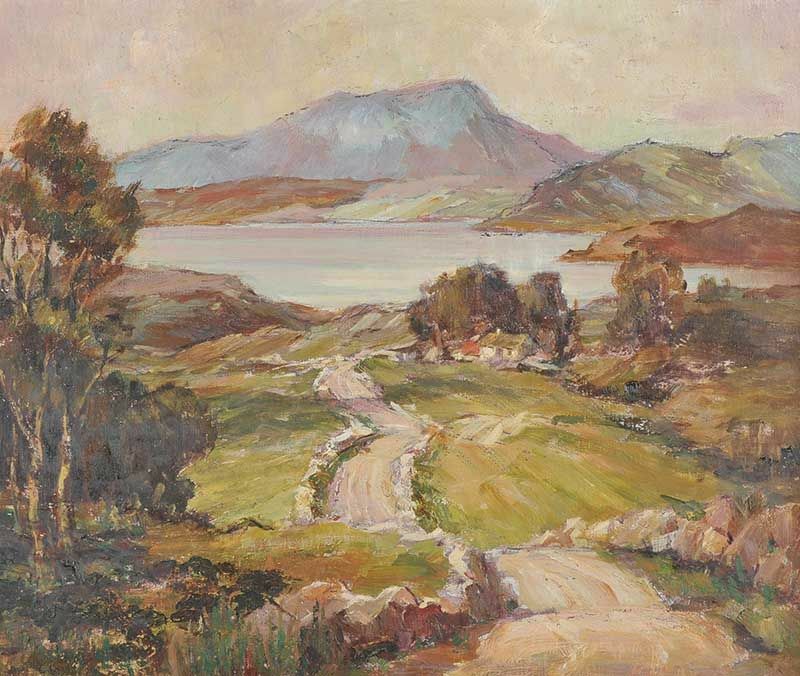 He sketched and painted all over Ireland, but he especially liked the atmosphere of Donegal and the West of Ireland. He exhibited in London, Montreal, Boston and Toronto and his paintings have been shown at the Royal Academy, London. He had several one man exhibitions at the Victor Waddington Galleries, Dublin, and in more recent years at the Walker Gallery, Coleraine; The Malone Gallery, Belfast; The Bell Gallery, Belfast and at the Oriel Gallery, Dublin. 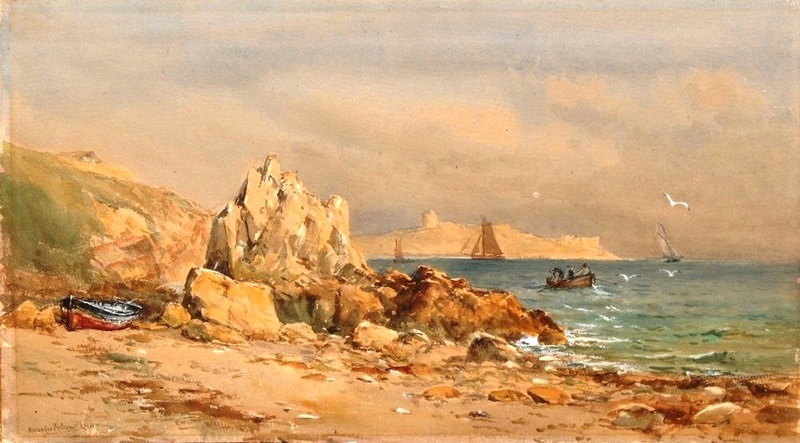 In his later years he had a summer studio at Sutton, Co. Dublin which enabled him to paint many scenes of Dublin and Dublin Bay. He is represented in many public and private collections including the Ulster Museum, Armagh County Museum and the Ulster Folk and Transport Museum. 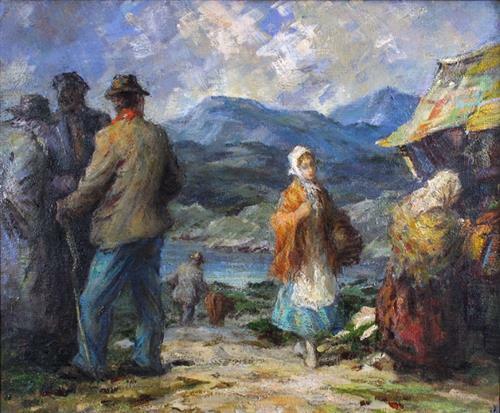 The auction record for a work by Maurice Canning Wilks was set in 2002, when his painting, entitled ‘Connemara Man’, was sold at Whyte’s, in Dublin, for €33,000. 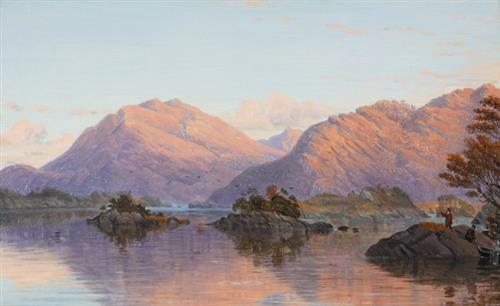 “Reflections, Glenveagh, Co.Donegal” oil on canvas (11″ x 20″) unsold at James Adams 1/6/16. Left to right: “Mountain Scene” watercolour (9″ x 11.5″) and “Feeding the Hens” watercolour (7″ x 11″) sold at Morgan O’Driscoll’s 2/12/2013 – €400.00. 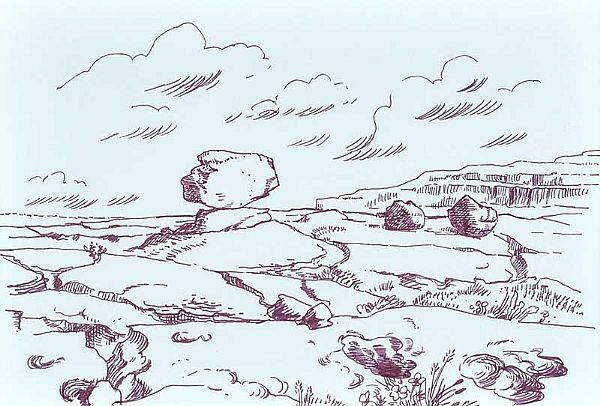 Left to right: “Red Rose” watercolour drawing (10″ x 8″), sold at Ross’s – 1/3/2017 for £280.00; and “The Burren” pen and ink drawing (8″ x 11″), unsold at Ross’s – 29/3/2017. Left to right: “The Harvester” oil on canvas (22″ x 18″), sold at Adams – 5/12/2018 for €3,000; and “Rockwood, Upperlands, Co.Derry” oil on canvas – with slight damage – (13.5″ x 17.5″), sold at Lawrences (Somerset) – 12/10/2018 for £160.00. 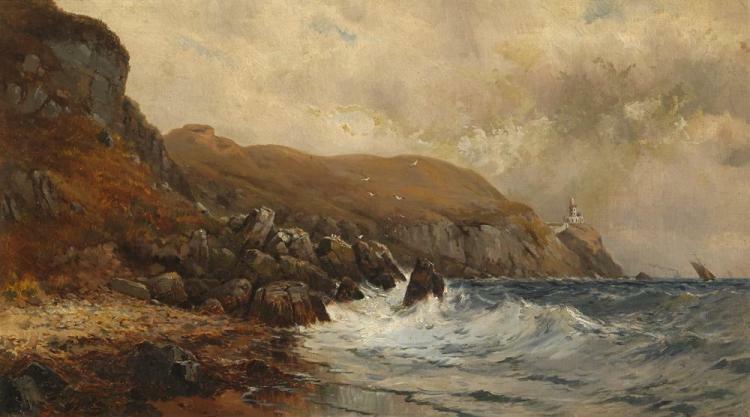 “The Bailey Lighthouse, Howth, 1889” oil on canvas (24″ x 42″), sold at Whyte’s – 26/9/2016 for €2,400.00. “Rowing the Cove” watercolour (11″ x 20″) sold at Bamfords Auction, Derbyshire 17/1/2017 for £160.00. Dalkey Island in the background. “Achill West Coast” watercolour (10″ x 18″), sold at Morgan O’Driscoll’s – 6/11/2017 for €240.00. 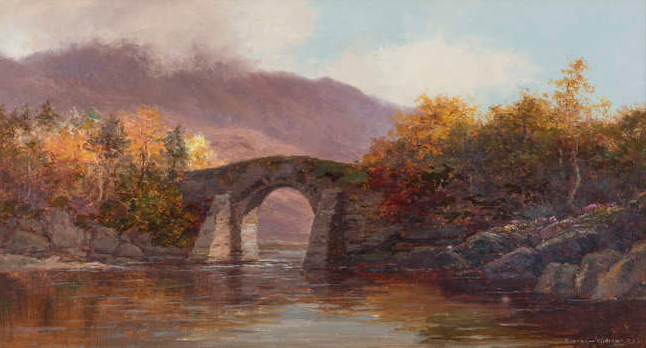 “Brickeen Bridge, Killarney, Co.Kerry” oil on canvas board (9.5″ x 18″), unsold at James Adams – 30/5/2018. 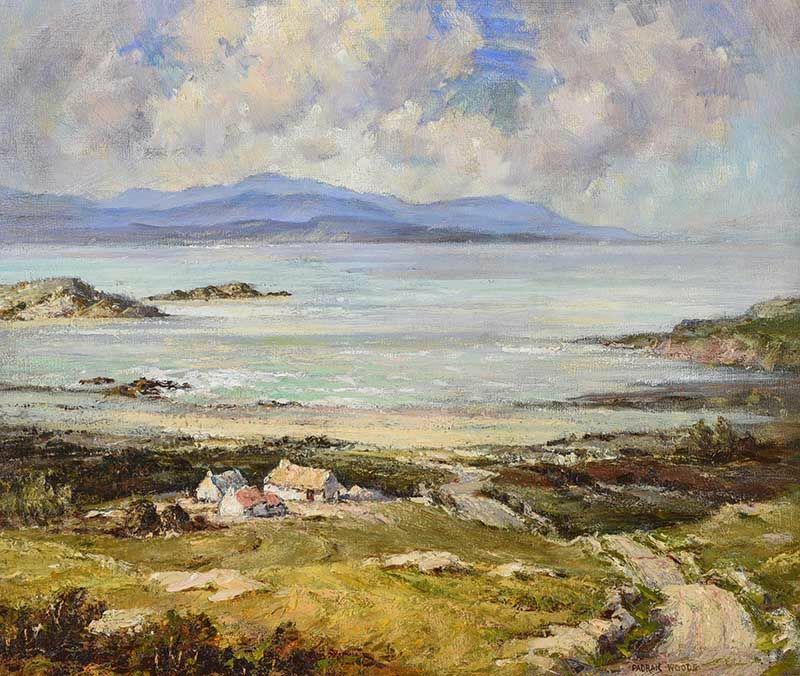 Alexander Williams was the first artist to open the West of Ireland, particularly Achill Island, to a wide audience. His extensive collection of memoirs and papers, preserved and never made public, form unique records from Victorian Ireland. His life was extraordinarily wide ranging. 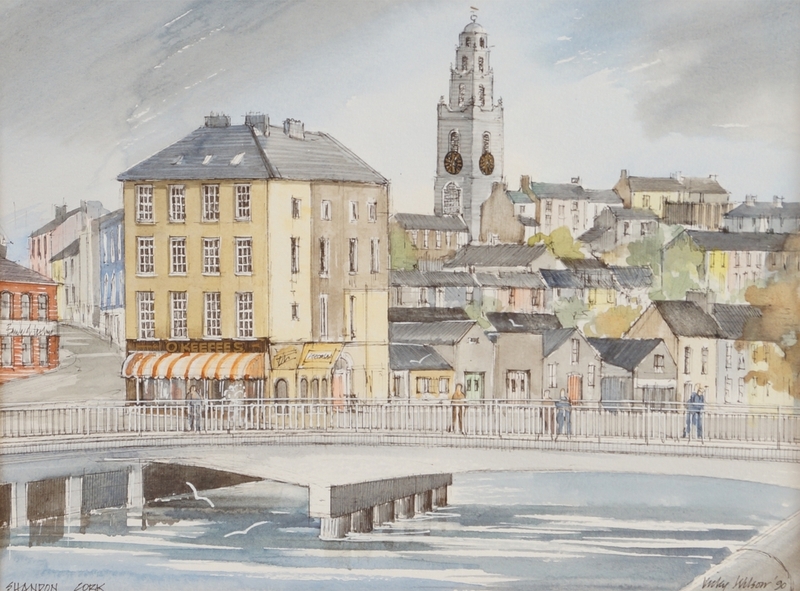 Primarily a landscape painter, his studies of old Dublin buildings and streetscapes are of particular interest. But he was also an apprentice hatter, a taxidermist and a professional singer, and with the help of Achill Islanders, he built a house and created a garden on Achill, now open to the public. 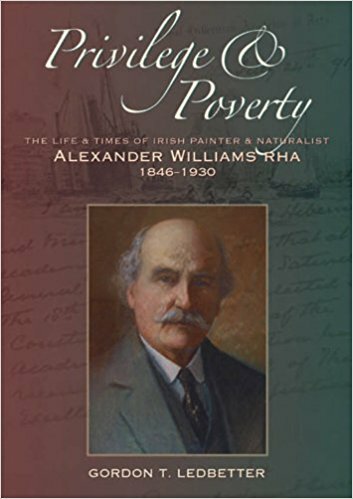 This absorbing biography gives unique glimpses of life in Dublin as seen by a painter favoured by the Lord Lieutenant and the ‘castle set’. 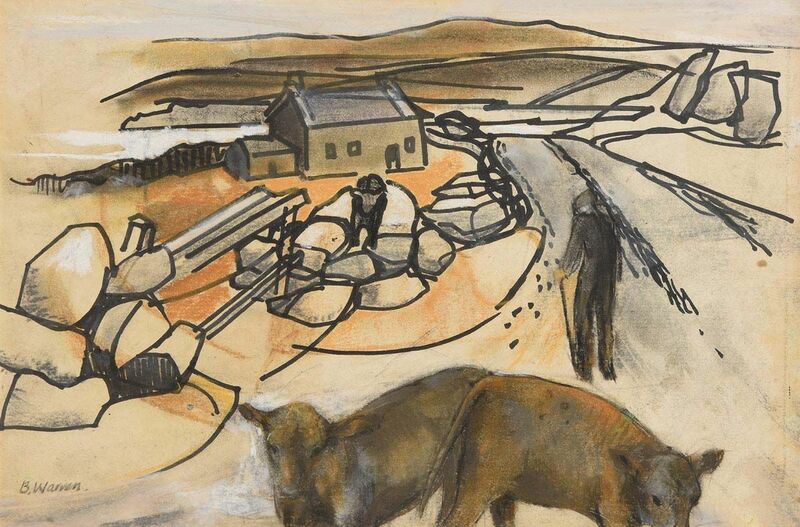 The contrast between the artist’s life and that of the islanders on impoverished Achill is stark. 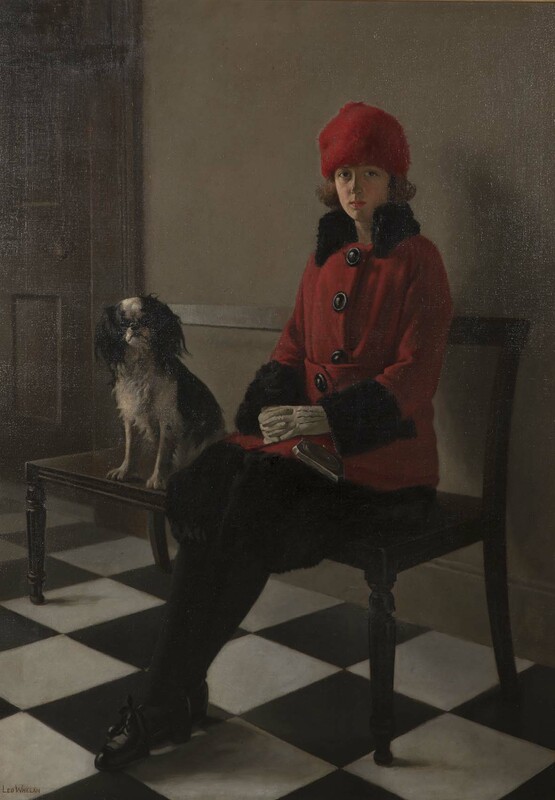 Williams exhibited at the RHA annually for 61 years, a unique record, and his exhibitions and recitals were social events attended by well-known names such as Bram Stoker, W. B. Yeats, Percy French and William Orpen. Illustrated with a wide selection of his work, this biography illuminates the diversity of his life and times with material found nowhere else. Published by the Collins Press in 2010 and still easily found online. 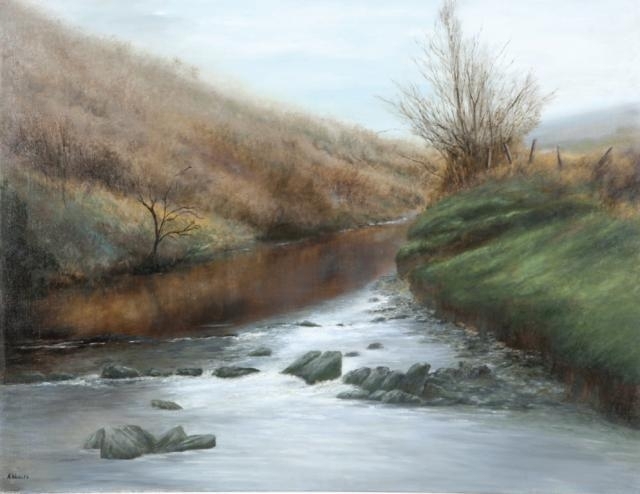 “Hibernia” pastel (25″ x 16″), sold at Adam’s – 25/9/2013 for €12,000. “Famine Harbour” oil on board (13″ x 19.5″), sold at Morgan O’Driscoll’s – 10/12/2018 for €260.00. 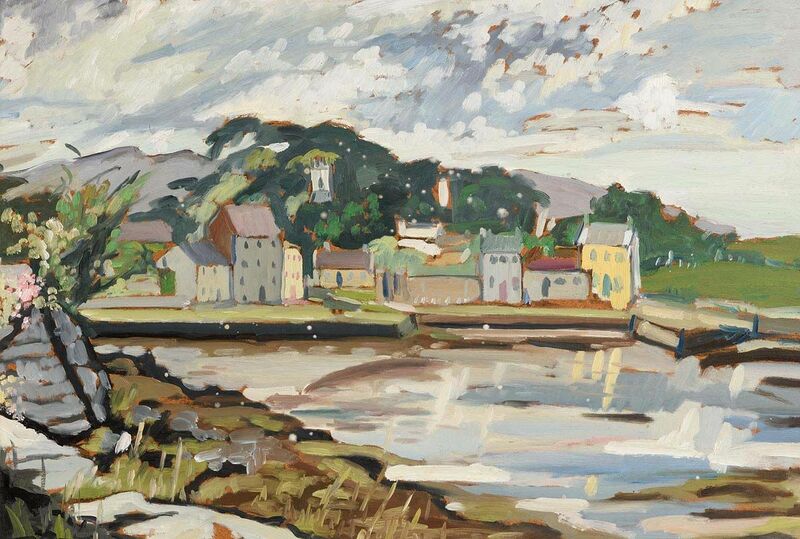 “Owenabue River, Currabinny and Crosshaven, Co.Cork” oil on board (14″ x 29″), sold at Morgan O’Driscoll’s – 13/3/2017 for €380.00. “South of Roundstone” oil on canvas board (7″ x 9″), sold at Morgan O’Driscoll’s – 13/3/2017 for €260.00. 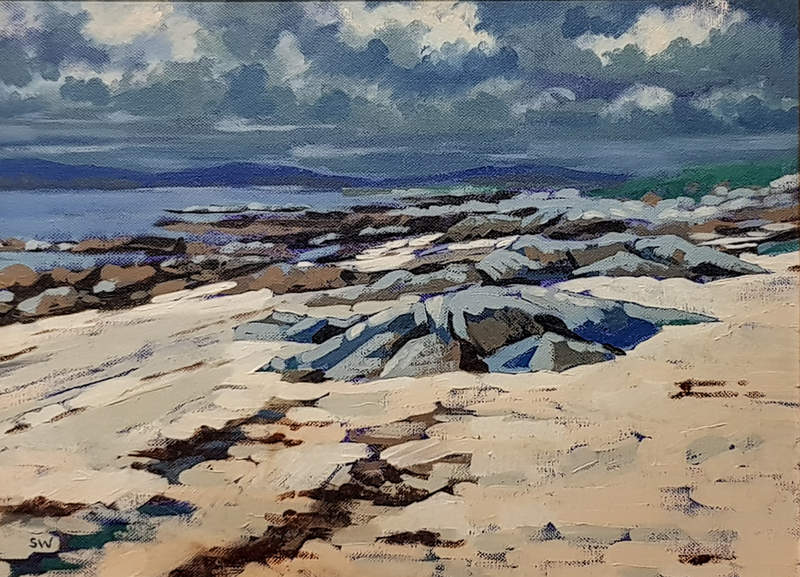 “The Fairy Stones, Connemara” oil on board (11″ x 16″), sold at Morgan O’Driscoll’s – 25/9/2017 for €160.00. 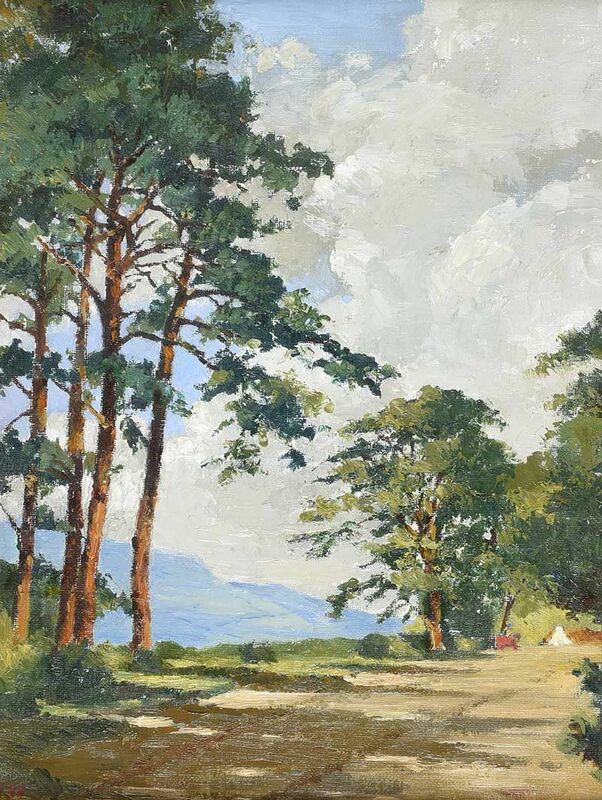 “Knocknama Wood, Lough Hyne” acrylic on canvas (35,5″ x 31.5″), sold at Morgan O’Driscoll’s – 25/6/2018 for €400.00. Still life and landscape painter from Belfast. 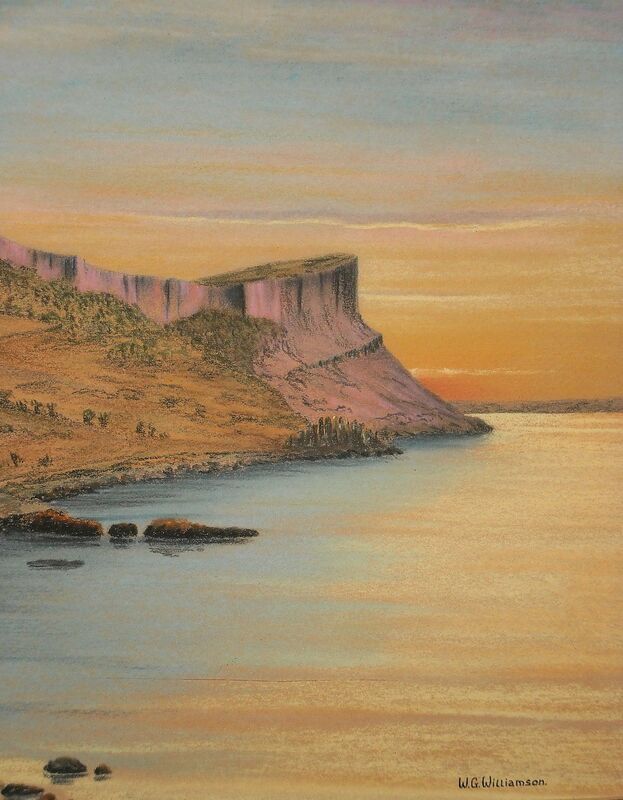 “Murlough Bay, Sunset” Co.Antrim, dated 1988, pastel (11.5″ x 8″). 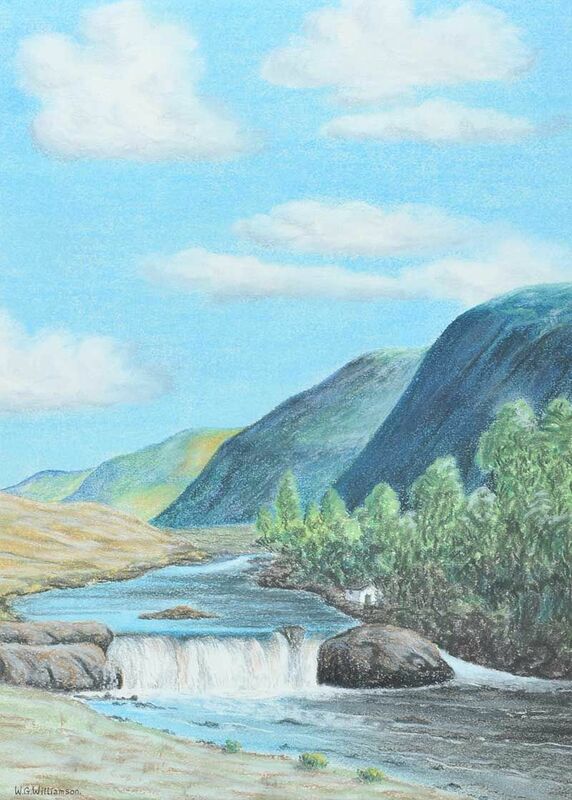 “The Aasleagh Falls, Galway” watercolour drawing (14″ x 10″), sold at Ross’s – 7/9/2016 for just £10.00. “An Macalla (The Echo)” watercolour (17″ x 11″), unsold at Whyte’s – 24/11/2008. Kilkenny born dramatist and painter. 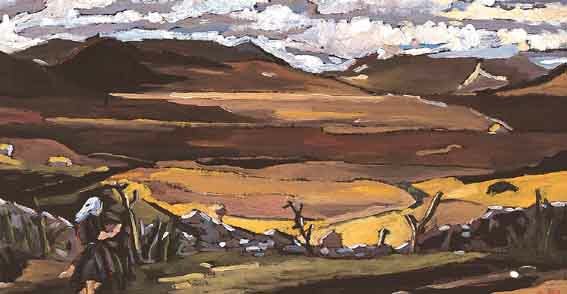 “Across the Bog, Louisburgh (Co.Mayo)” oil on board (14″ x 27″), sold at Whyte’s – 13/6/2001 for €2,158 including buyer’s premium. 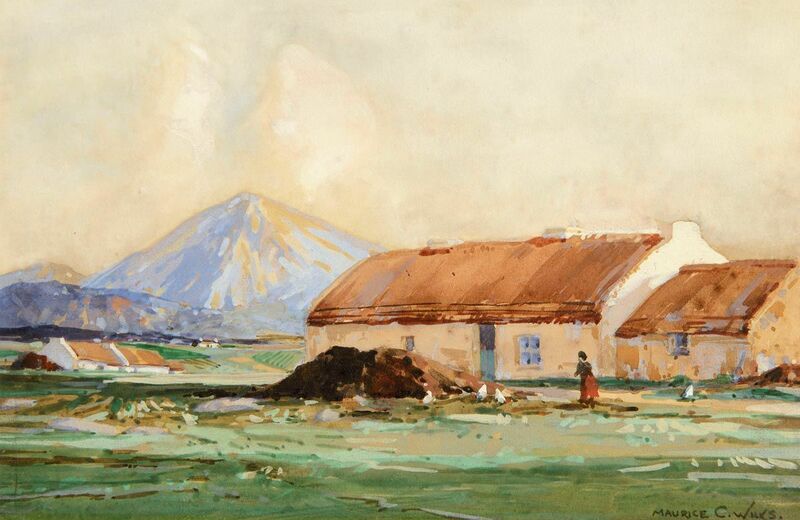 Left to right: “Croagh Patrick, from Napper, Co.Mayo” oil on board. 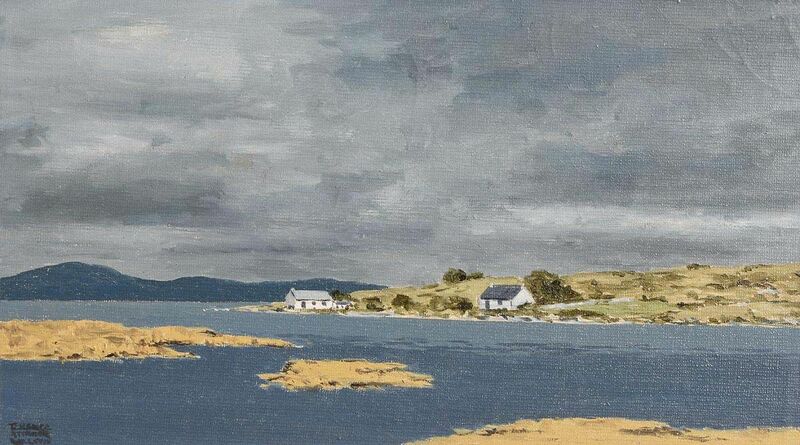 Sold de Veres 22/5/2012 – €1,300.00; and “Little Harbour, North Clare” – Kinvara according to old label – dated 1972, oil on board (17″ x 25″), sold at Morgan O’Driscoll’s – 22/1/2018 for €1,700. 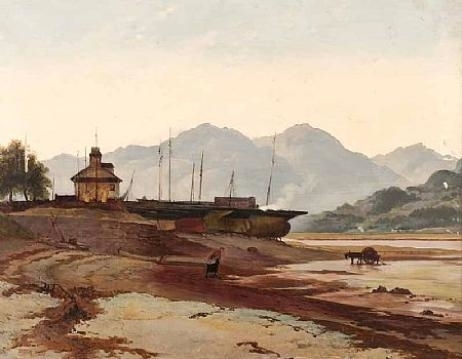 James Glen Wilson was a landscape painter, naval photographer and surveyor from County Down. 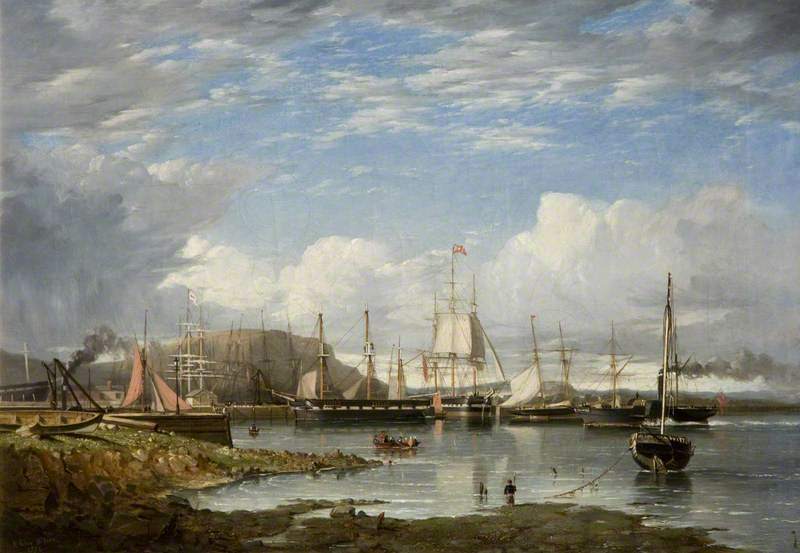 “Belfast Quay” 1851, oil on canvas (16″ x 24″ ) © Ulster Museum. Dublin born artist living and working in Skerries. “The Meadow” oil on canvas (23.5” x 23.5”). 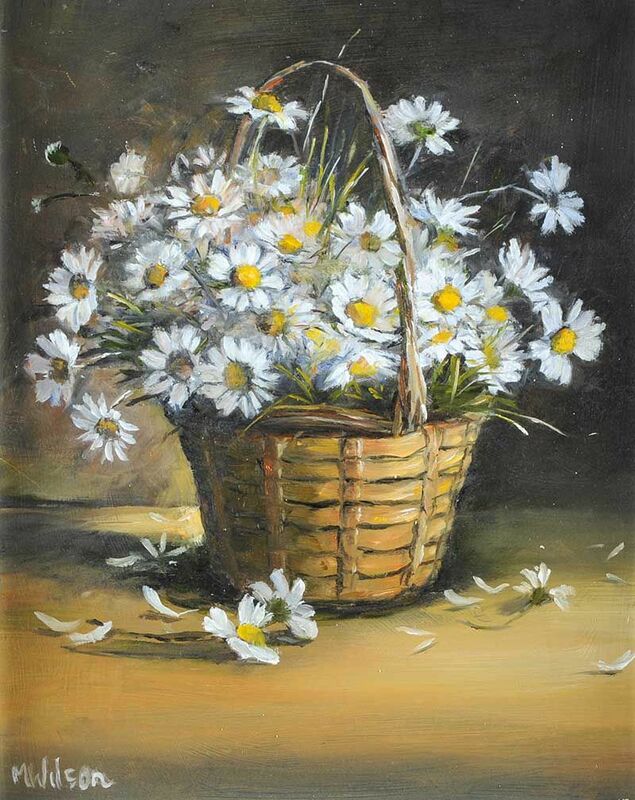 Left to right: “Daisies in a Basket” oil on board (10″ x 8″); and “Wild Summer Flowers” oil on board (10″ x 8″) – both sold at Ross’s – 31/5/2017 for £140.00 respectively. “Man, Dog & Reflections” oil on board (12″ x 16″), unsold at Ross’s – 9/8/2017. “Shandon, Cork” watercolour (9″ x 12″), unsold at Sheppard’s – 28/6/2017. 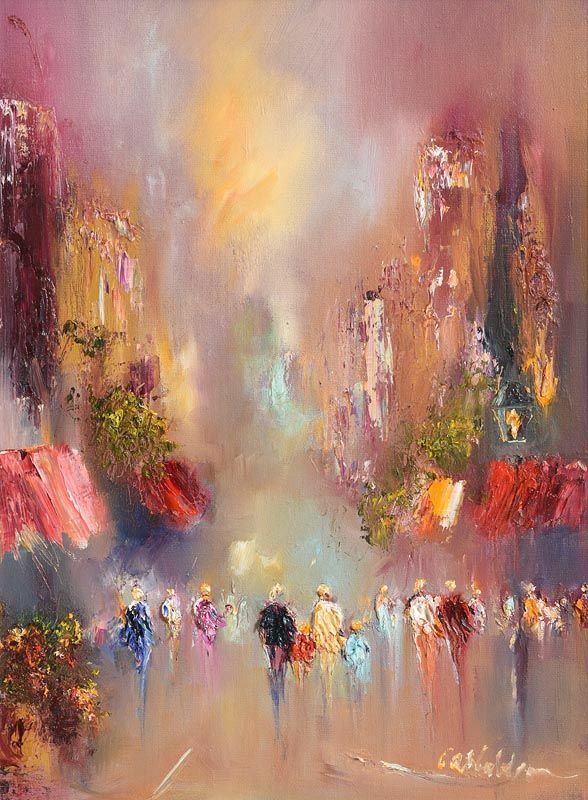 A self-taught painter, Dana is originally from Dublin, where she studied History of Art at Trinity College. 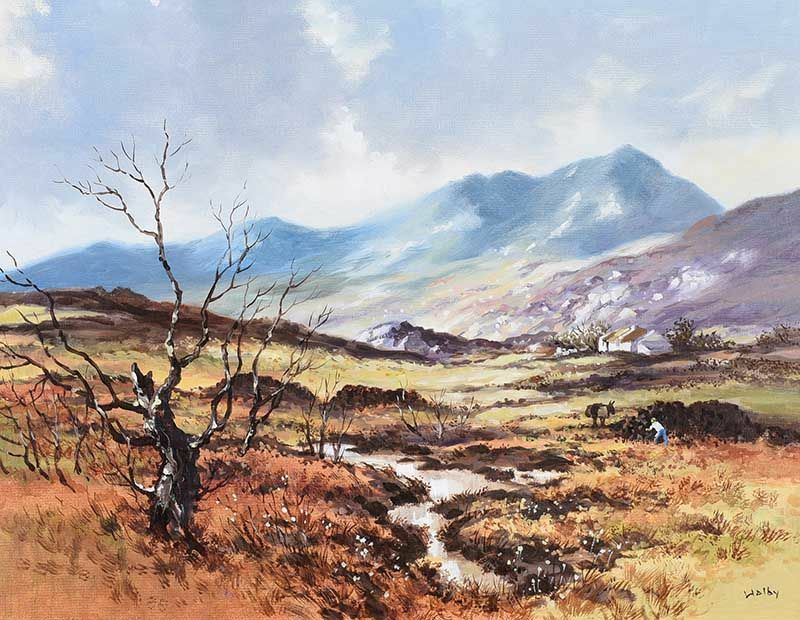 She now lives in South Kerry where the local landscape often inspires her work. 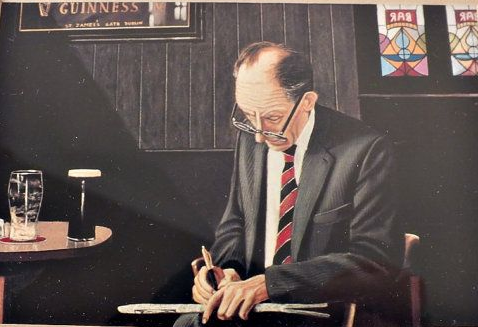 Dublin pastel artist known for his pub pictures. “The Crossword with Guinness by Bailey’s Boudoir“. 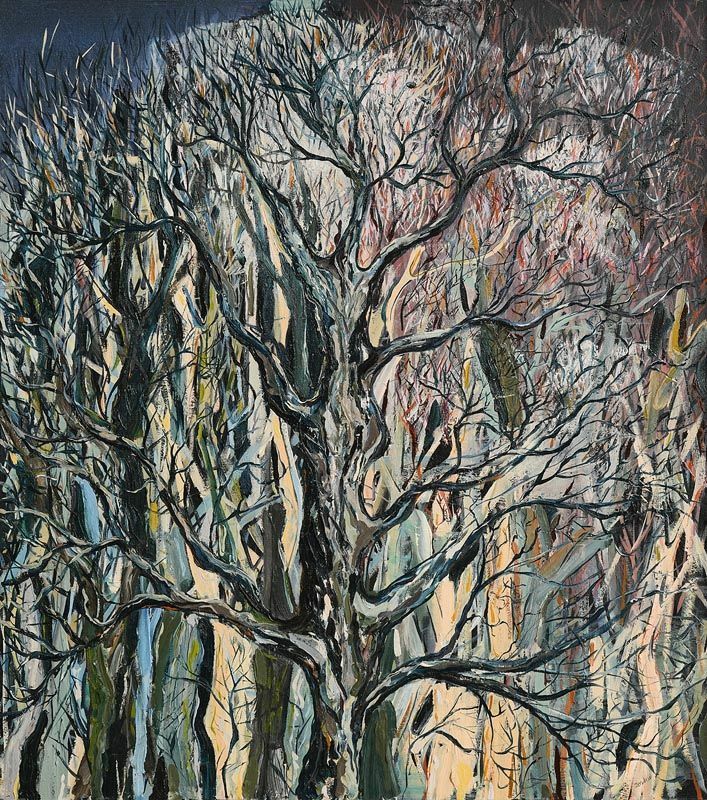 Irene Woods is an established artist based in County Louth. 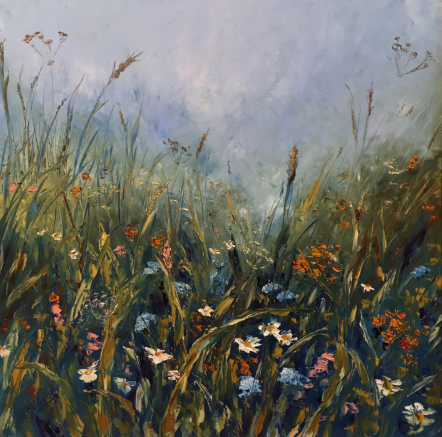 She specialises in landscape painting, much of her subject matter is inspired by the beautiful scenery in Carlingford and the Cooley Peninsula where she works from her studio, and the surrounding areas North and South of the Border. 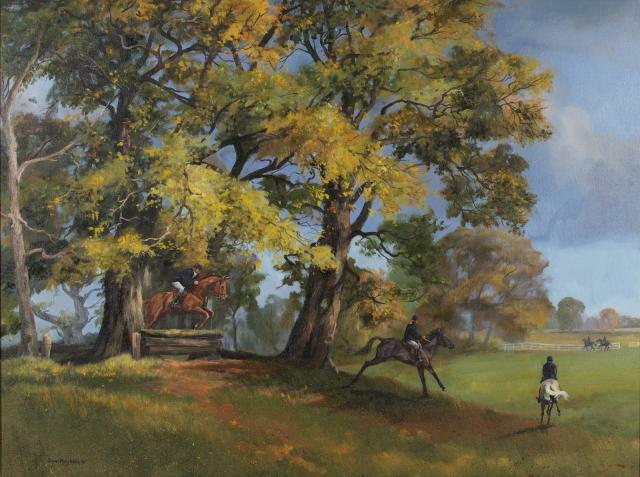 As well as landscapes she paints well-observed compositions of animals, mainly sheep and horses. Left to right: “She moved through the Fair” oil on canvas. 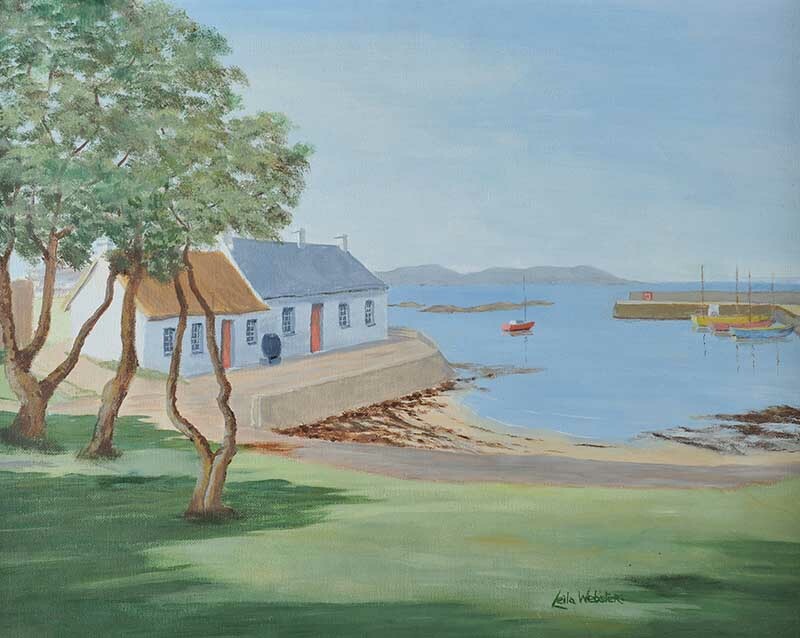 Sold at Whytes – 25/7/2016 for €800.00; and “Donegal” oil on canvas (20″ x 24″), sold at Ross’s – 5/10/2016 for £400.00. Left to right: “Mount Errigal” oil on panel (15″ x 16.5″), sold on eBay – 13/8/2017 for £269.00; and “Cottage by the Sea, West of Ireland” oil on canvas (20″ x 24″), sold at Ross’s – 25/4/2018 for £650.00. 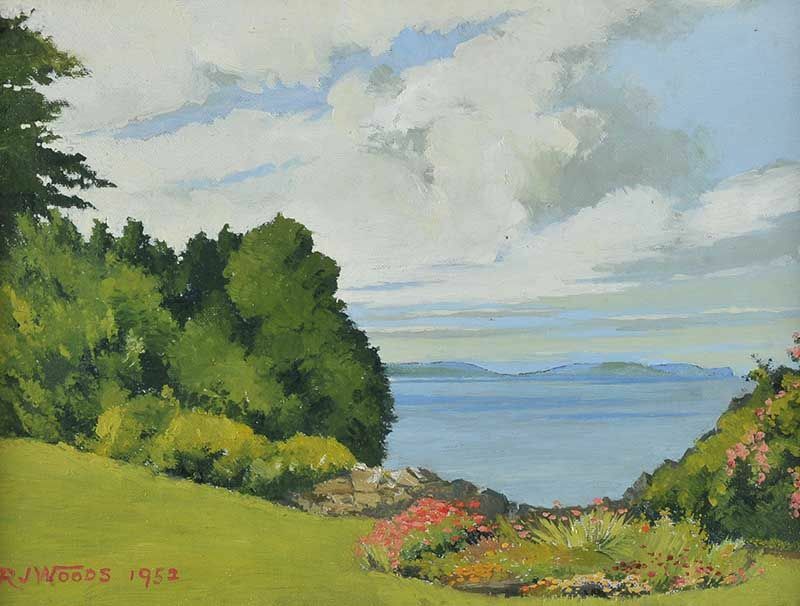 “Belfast Lough from the Pickie side” oil on board, dated 1952 (10″ x 14″), sold at Ross’s – 7/12/2016 for £30.00. “Near Belfast” oil on board (15″ x 11″), sold at Ross’s – 10/10/2018 for £60. 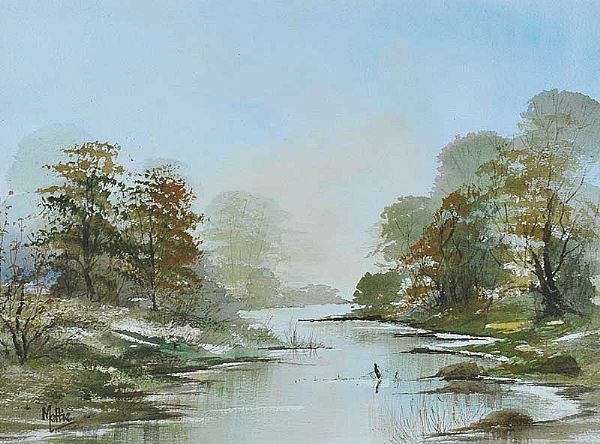 “River at Plassey, Co.Limerick” oil on canvas (27.5″ x 35.5″), sold at Dolan’s – 9/12/2012 for €300.00. 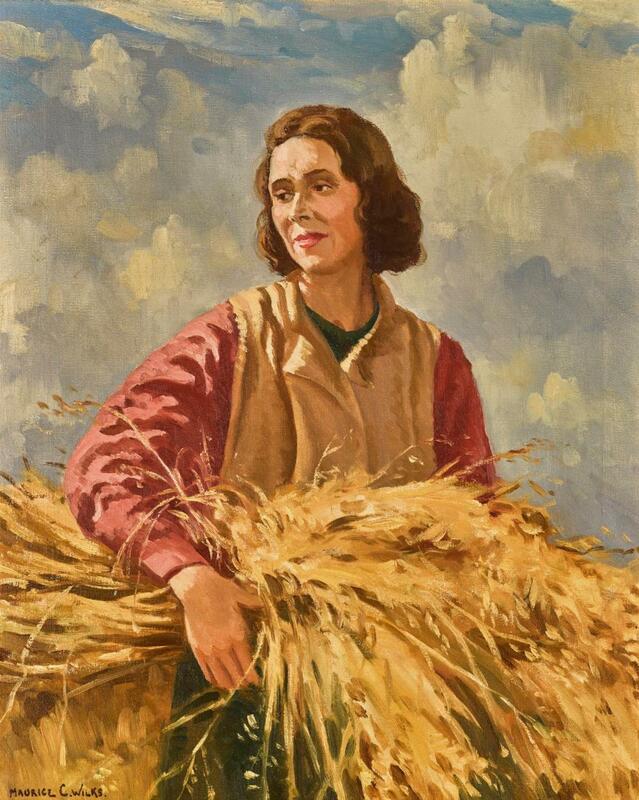 Evelyn Wrynn was born in the West of Ireland and has lived in Galway for most of her adult life. She has a life-long interest in abroad spectrum of arts and crafts. 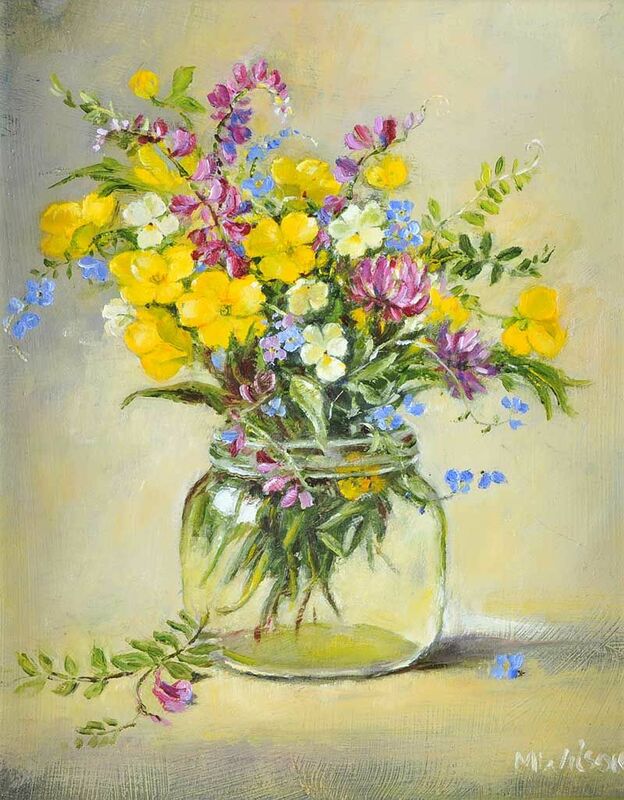 Her current interests are focused on landscape and still life oil painting, while also experimenting with a variety of glass painting techniques. Married to Stephen Catterson Smith PRHA (1806-1872). 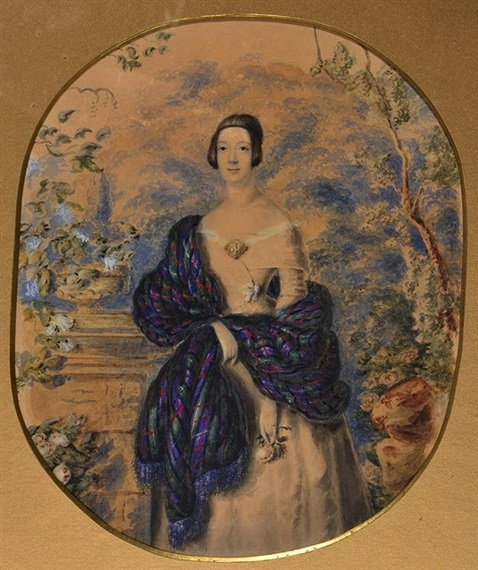 “Portrait of a lady in a Garden” dated 1861 (10″ x 8″) – sold at Mallams, Oxford – 8/7/2015 for £20.00. 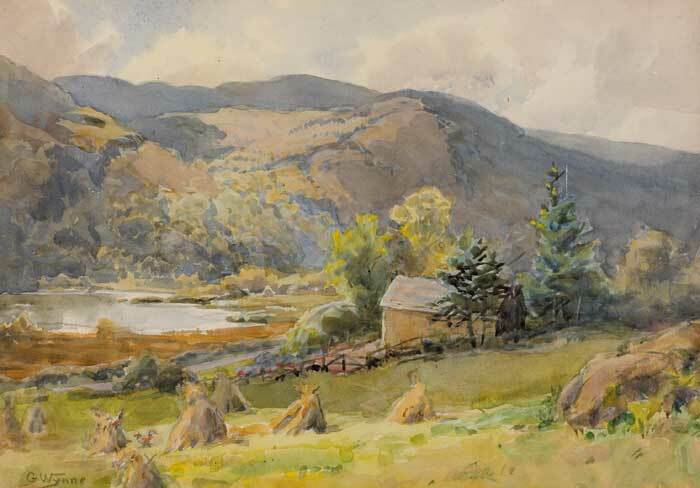 Gladys Wynne was an Irish watercolour artist, who spent most of her life in Glendalough, County Wicklow, living in Lake Cottage. 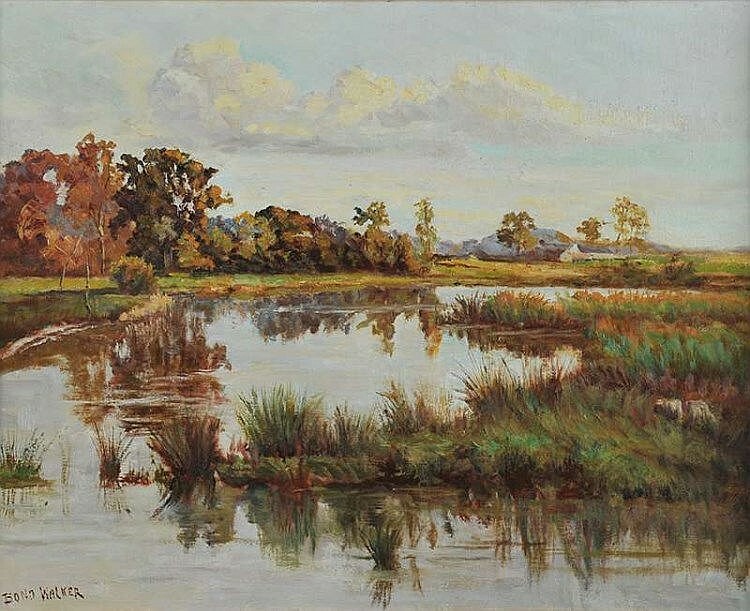 Landscape was her chosen field and she painted the area throughout her career. “A Country Garden in Ireland” watercolour (9″ x 12.5″) sold on eBay – 14/5/015 for £48.00. 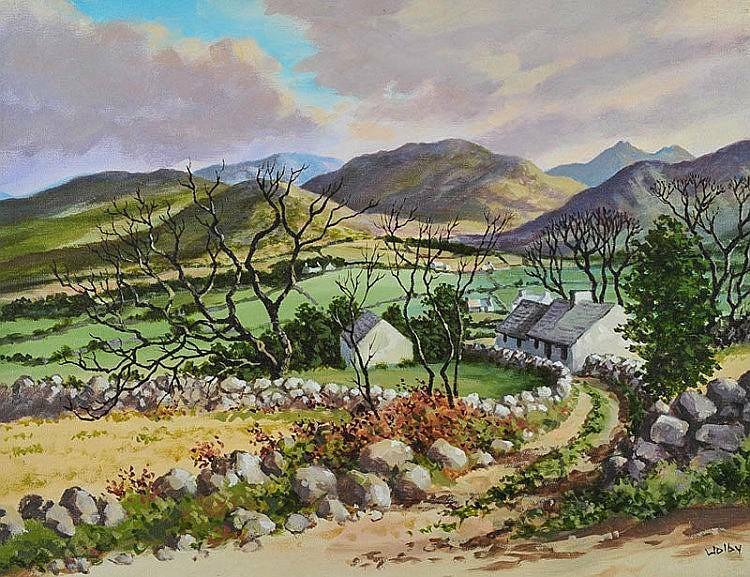 “Haystacks in a Valley, County Wicklow” watercolour (10″ x 14.5″) sold at Whyte’s – 10/12/2005 for €1,400.